There were changes made to the sign-up and sign-in processes over the last two days. These changes should not negatively impact users, but contact Scott Gerber via Feedback if problems arise. 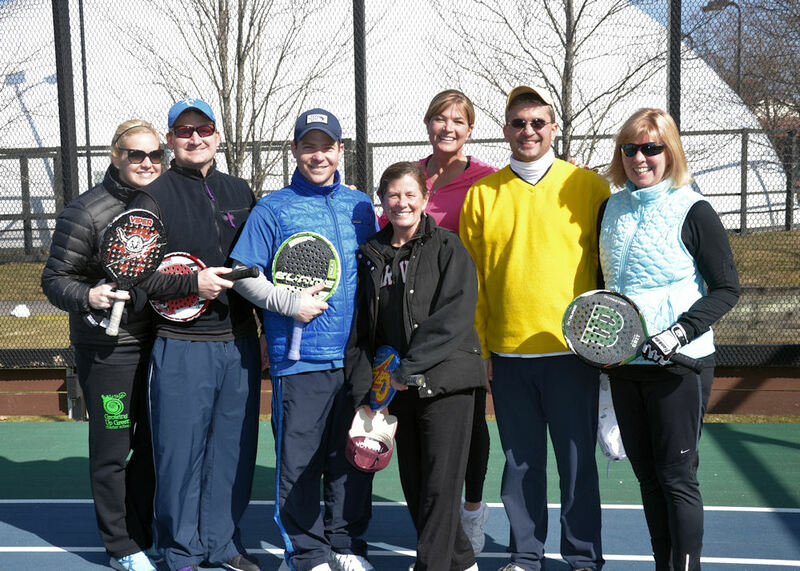 The weather was perfect as the Central Ohio Platform Tennis Association (COPTA) started its leagues on November 4. There are two leagues again this year - one at a 3.0 level and another at 4.0. The 3.0 League will field two courts per match this year while the 4.0 League will continue to field three. The clubs fielding teams (and number) are: Elysium (1), Lakes (3), New Albany (3), Scioto (2), Swim & Racquet (2), and Worthington Hills (2). This is the seventh year that there has been league play in Central Ohio. The COPTA Season Kick-Off Party was held in the rain at Lakes Golf and Country Club on Sunday, October 29. Attendance was as you would expect on a rainy day, but those who played had a good time and drank everyone else's adult beverages and ate their chips (which included Chex Mix). To follow all of the league action, click on League Information. Click to view the all-important League Captains. 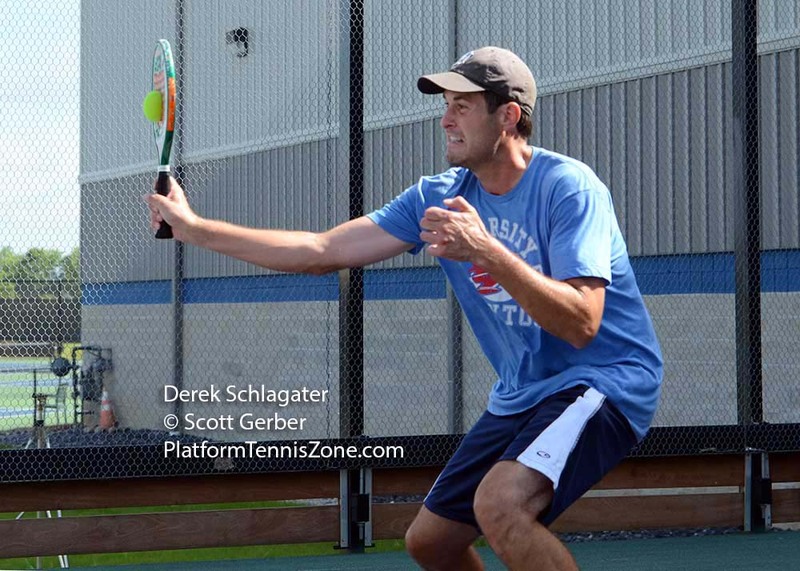 For those familiar with the OhioTennisZone.com web site, this web site utilizes much of its software. 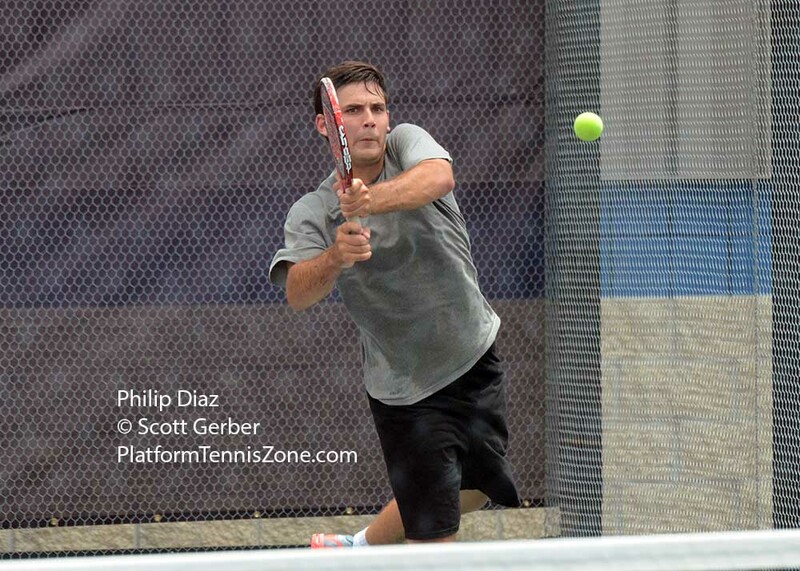 The OhioTennisZone web site primarily covers Ohio high school tennis on a state-wide basis. 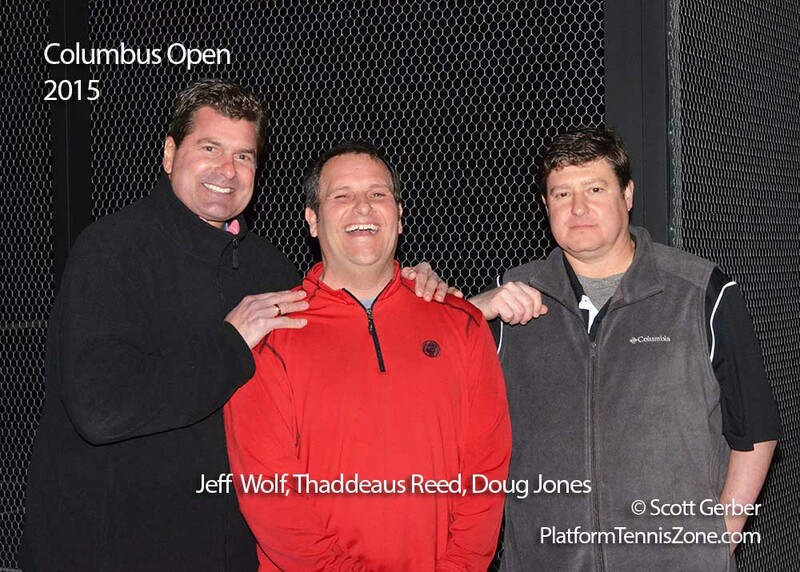 The COPTA consists of Bill Cseplo (president), Rob Martin (treasurer), and Scott Gerber (scores / web site) and the goal is to promote and increase platform tennis play in central Ohio. 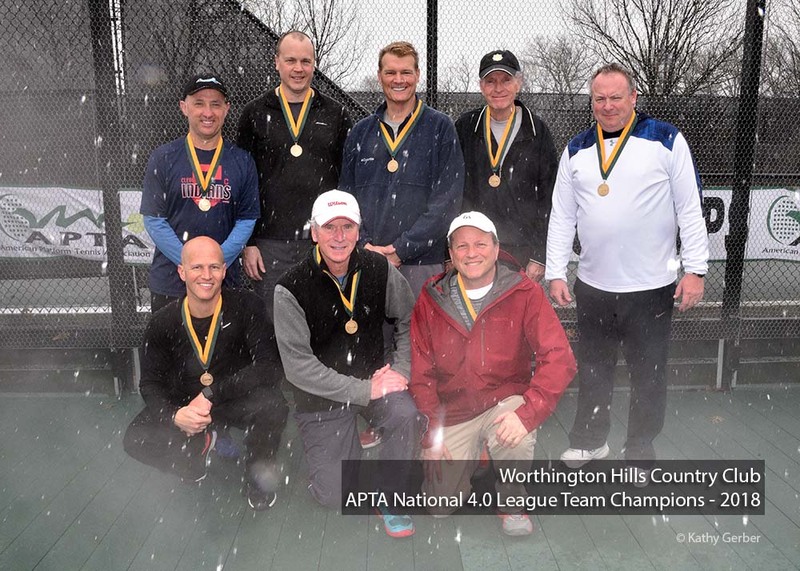 The weather was abysmal but the play was not as the Worthington Hills 4.0 team won the American Platform Tennis Association tournament in Chicago in mid-April. The weather was a smorgasbord of bad. The weather alternated between rain, snow, sleet, fog, and drizzle. 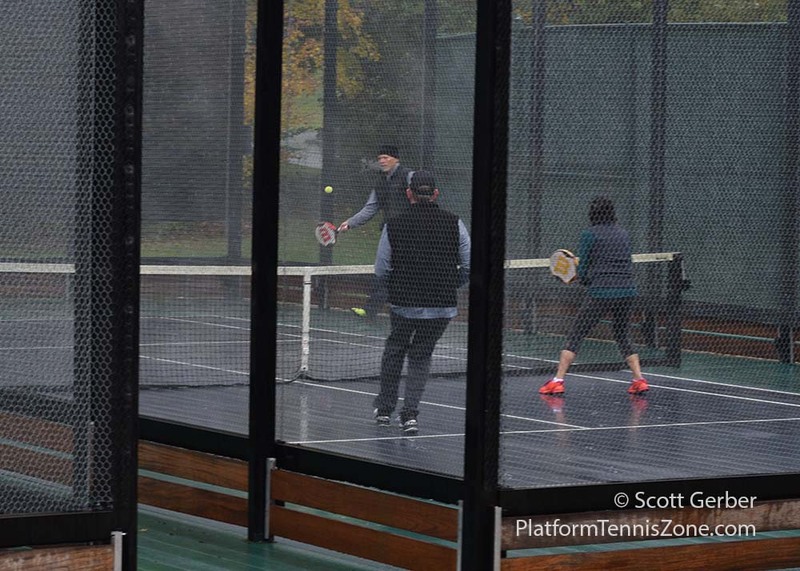 The good news is that the paddle facilities were a paddle tennis player's paradise. For those going to heaven, this is a preview of things to come.. 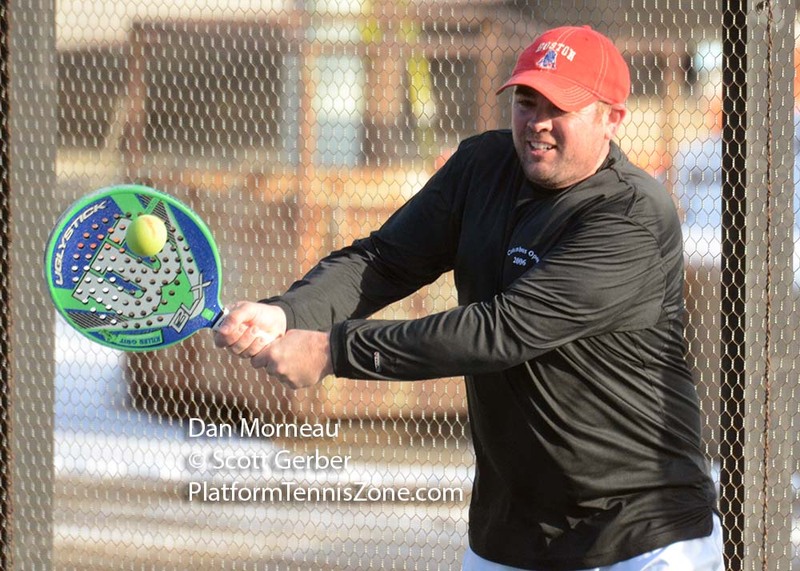 Things did not start out well in its first three matches for Worthington Hills on Saturday. The first two matches were losses but they were somewhat close. WHCC was then beaten soundly in its third match. As it turned out, Saturday was a seeding round to insure that WHCC was a 4.0 team. The other teams WHCC played were 4.5, 4.5, and 5.0 teams. Sunday turned out much better as WHCC faced other 4.0 teams and WHCC won those matches decisively. 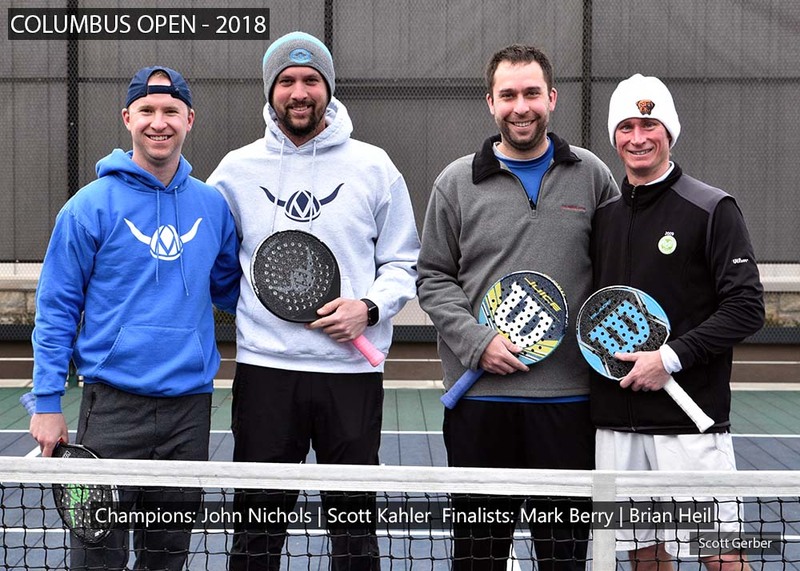 As for the teams WHCC played on Saturday, the two 4.5 teams were in the finals against each other and the 5.0 team won their respective championship. 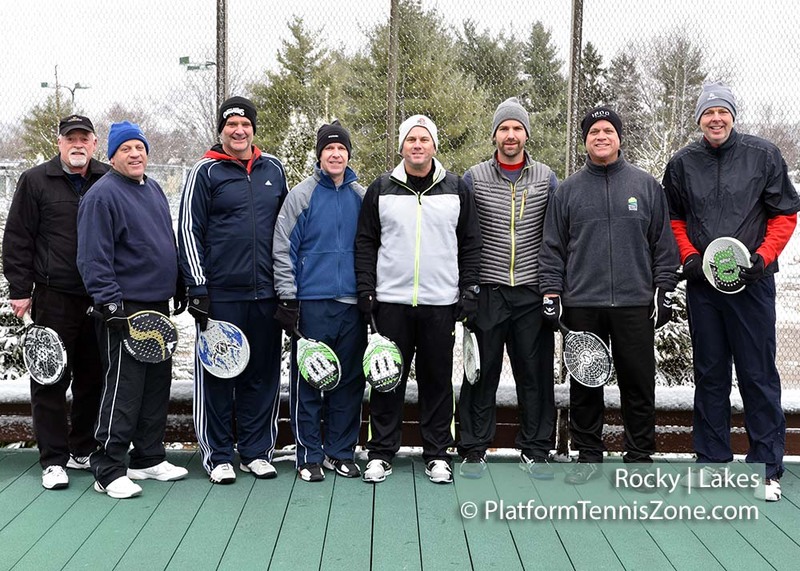 The WHCC team consisted of Brad Marquis (the super captain), Frank Heil, Martin Roesch, Bob Birzer, Scott Gerber, Eric Lothes, John Lindaman, and Rob Martin. 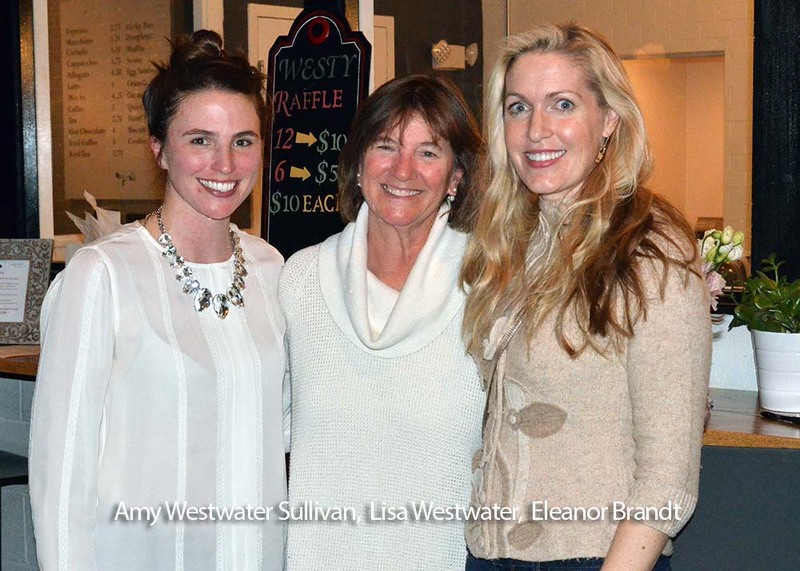 Other members of the WHCC entourage included Kathy Gerber, Pam Birzer, Heather Lindaman, and Pam Heil. For many, the high school years were an awkward time. Nothing was more stressful than handling the logistical nightmare of going to the prom. Who were you going to go with? How could you avoid the person who you did not want to go with? What were you going to wear? Would your mom and dad approve? Elysium makes all of this easy with its third annual Paddle Prom. 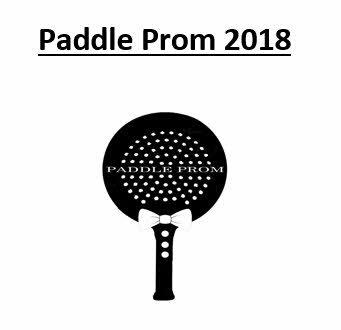 The Prom will take place on Saturday, May 19th. 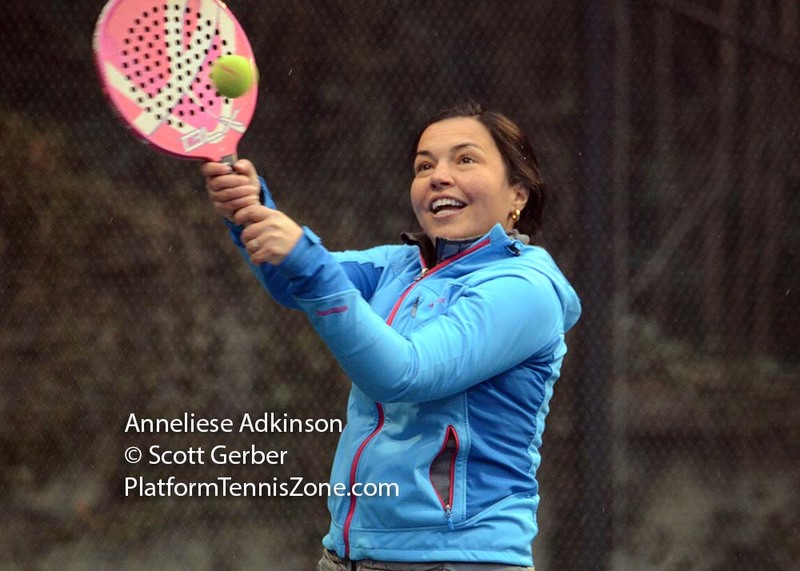 This is a Mixed Doubles Event, and all levels of paddle players are welcome. Players are guaranteed three matches and the cost is $120 / team. Favors, balls, lunch, and beverages are included. 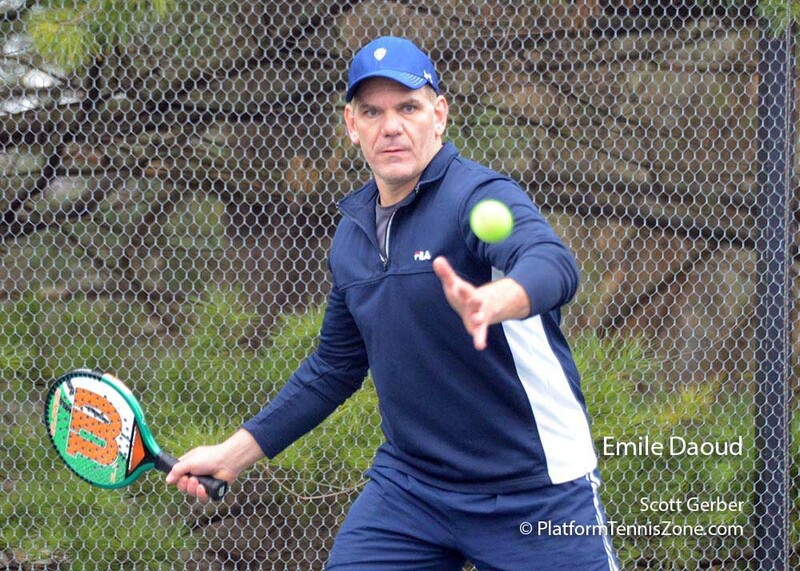 You can sign-up with another person or Elysium will help you find that special someone who your mom and dad will simply adore - especially if it is only for the above mentioned, three platform tennis matches - and that's it. 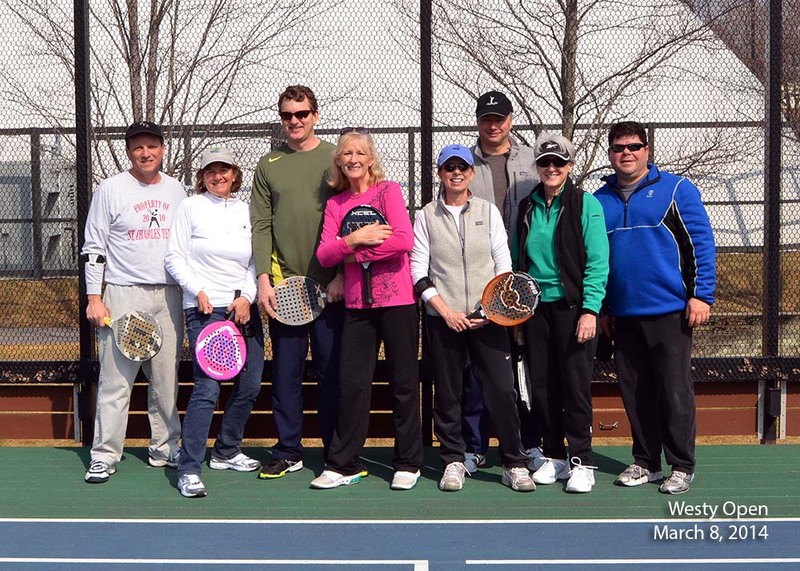 Call Elysium Tennis at 614-873-8749 to register. The deadline May 15. 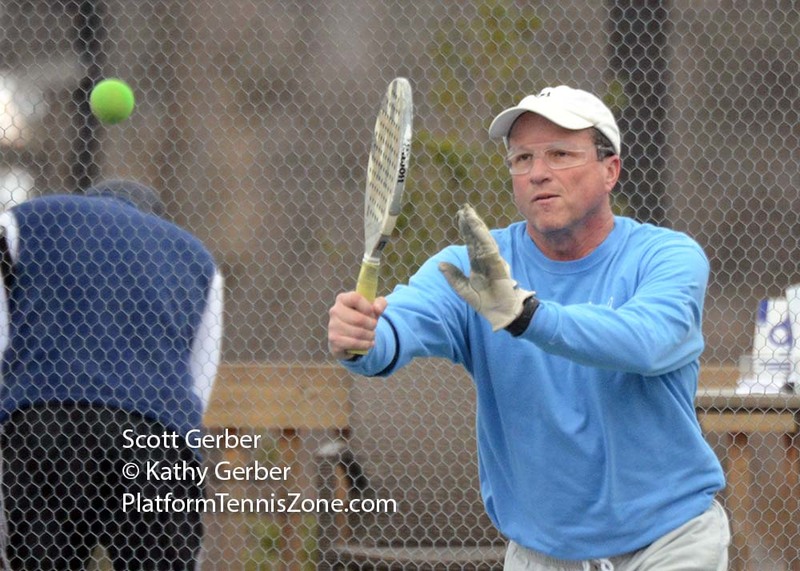 The weather was perfect as the Central Ohio Platform Tennis League finished its regular season yesterday. 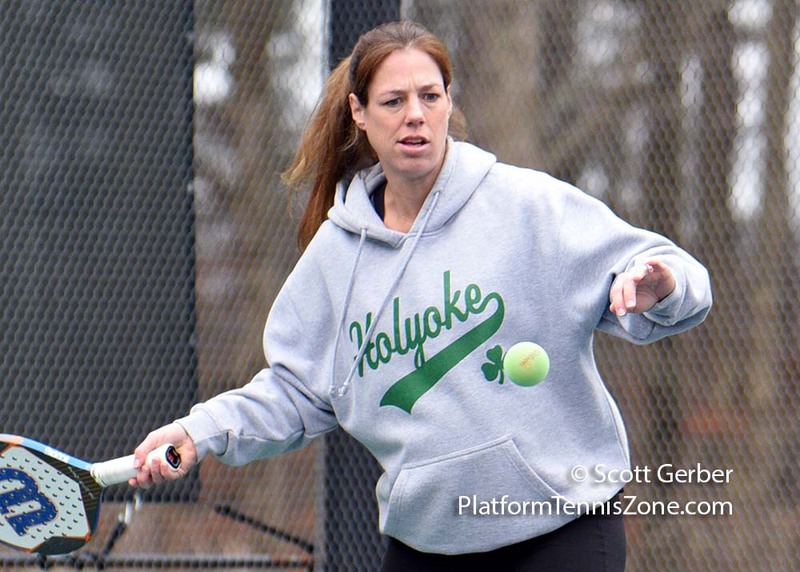 The event was hosted by Elysium Tennis and there were approximately 35 players who participated. There was plenty of City Barbecue food remaining as players jumped from one match to another. 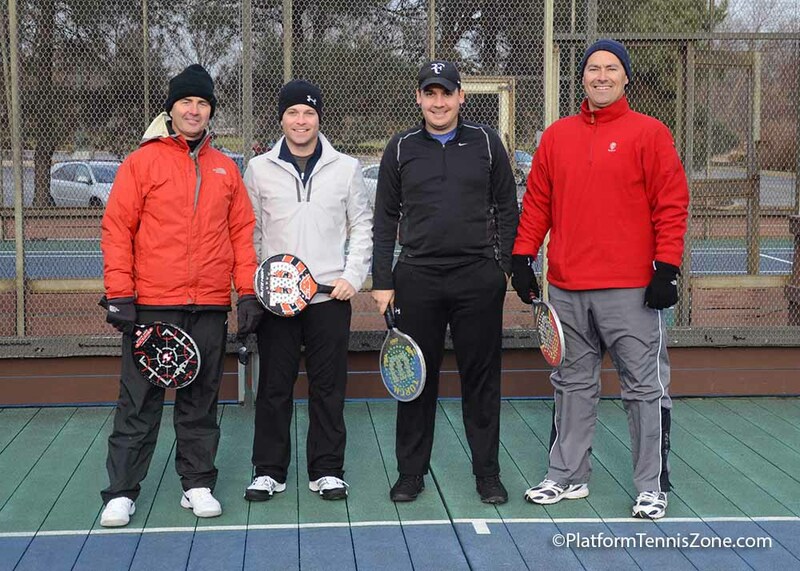 Using an abbreviated format, guys played a total of six games and then allowed others to play. Through much perseverance, the guys did step up and complete the task of "cleaning up" the adult beverages. 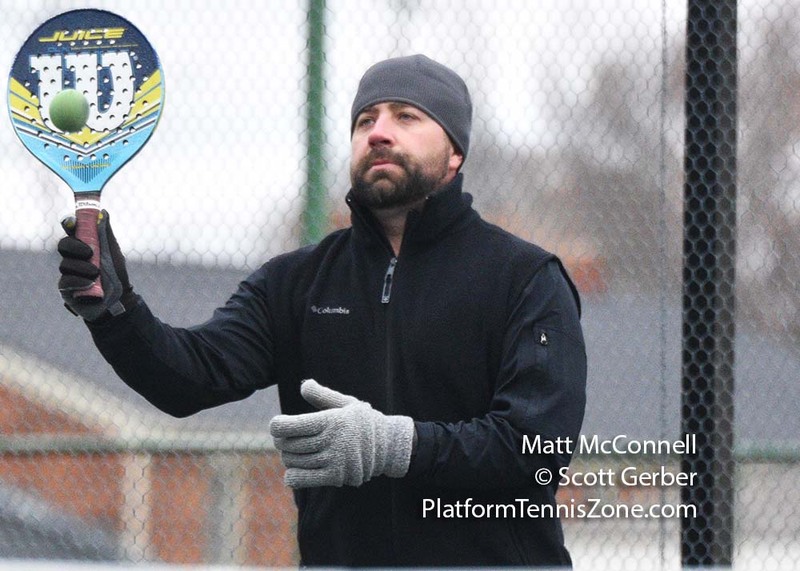 The Central Ohio Platform Tennis Association (COPTA) charged each player $10 to participate and the COPTA picked up the rest of the cost using league fees. The final league standings ended with Worthington Hills on top with a13-1 record in the 4.0 League. New Albany came in second. With an 8-3 record, Lakes finished first in 3.0 and New Albany was second. The plaques are not "in the mail" yet, but they will be eventually. For the rest of the league standings, click on League Information. Speaking of league fees... If your club has not yet paid, please get that check into Rob Martin pronto. 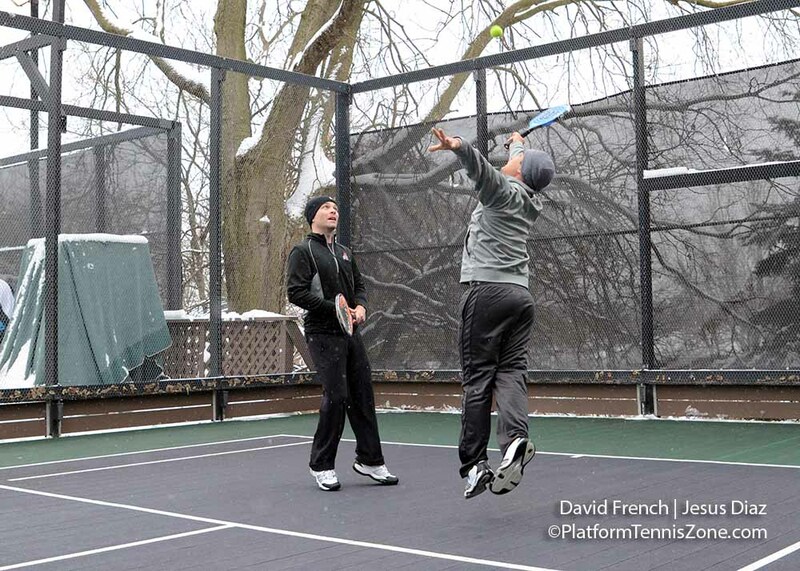 Any money left in the budget goes toward promoting the sport of platform tennis in central Ohio. 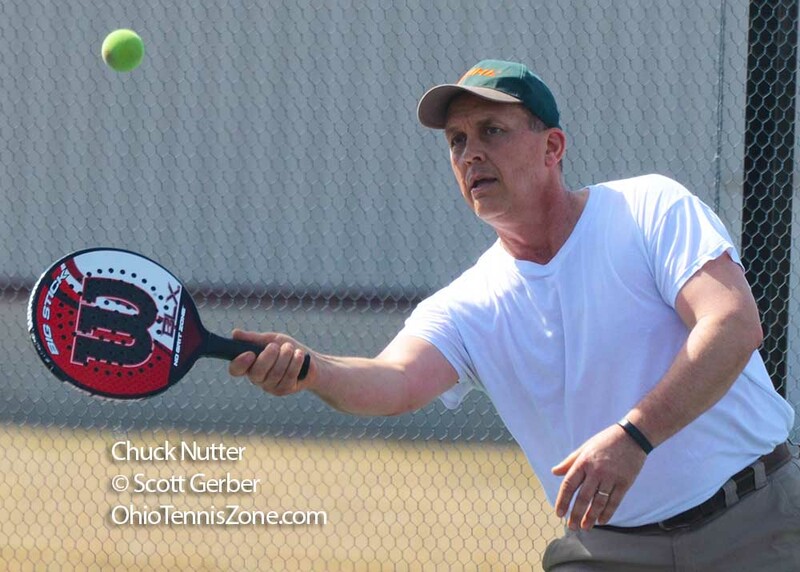 Think of the COPTA (Central Ohio Platform Tennis Association) as a mini-GCTA (Greater Columbus Tennis Association). In future years, it would be great to offer players 3.5 and 4.5 leagues. Before expansion though, we need to greatly reduce the number of court defaults that take place each Sunday. The COPTA (Bill Cseplo (President), Rob Martin (Treasurer), and Scott Gerber (web site | league) will be soliciting feedback on ways to make the league better for next year. Please write down your thoughts now while everything is still fresh in your minds. Many clubs will continue to play until March, but most do not have summer league activities. For those who want to play in the summer, Elysium offers a summer league on Tuesday nights. 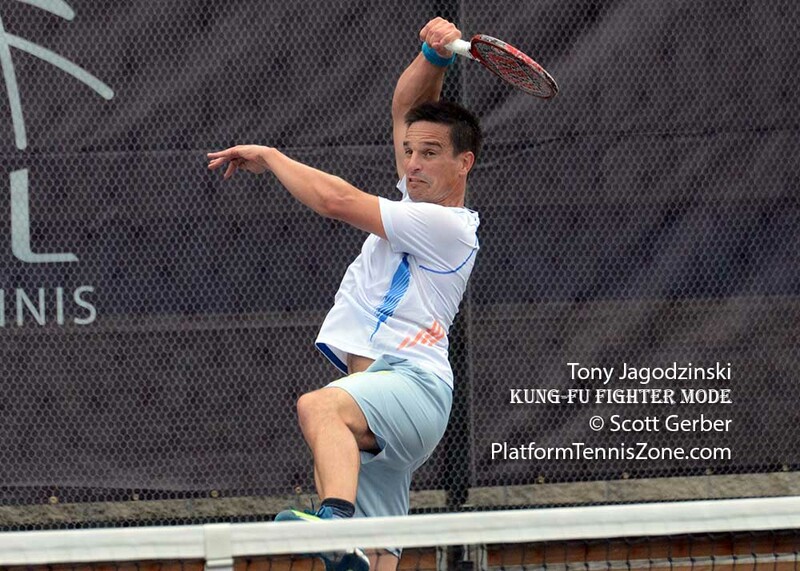 It matches players of similar abilities to compete using a court 1, 2, 3, 4 format. Teams consist of men and women players. The bright sun made it great to linger outside, but it made picture taking challenging because of the harsh shadows. (Harsh shadows cause parts of the photo to be too bright while other parts are too dark. It is especially problematic when players where hats) To the right are some of the better photos. Click on any photo to enlarge. There continues to be a debate on when players become too good for the 4.0 League. The main objective is for people to play. While it is important that the matches be competitive, we would rather error in including the better players until a 4.5 league is formed. 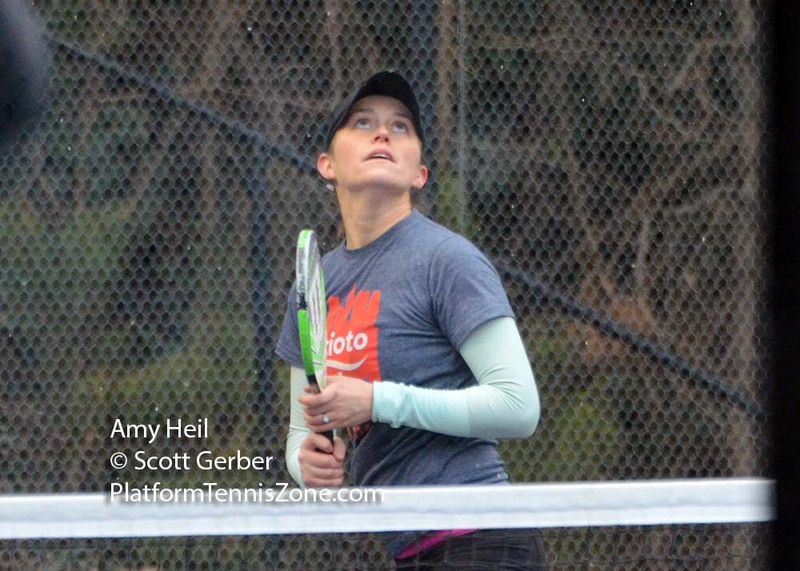 The weather was largely cooperative for this weekend's Columbus Open. 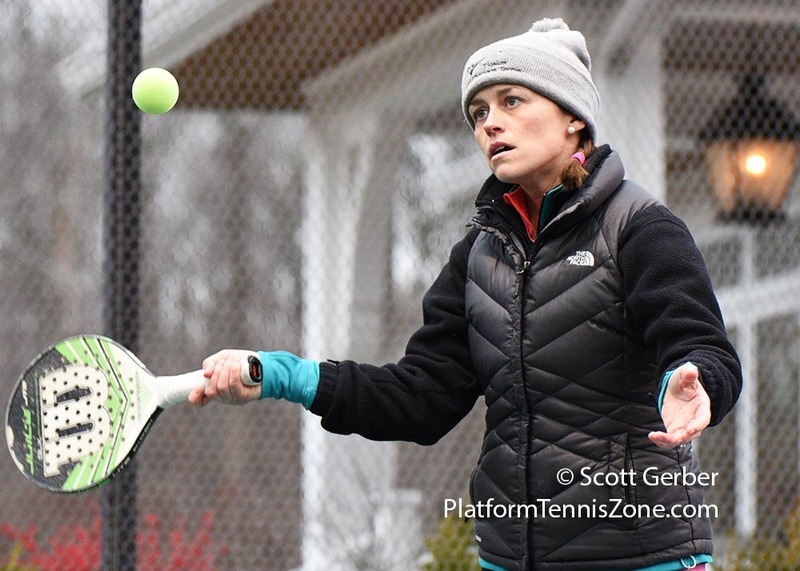 Temperatures started at a chilly 12 degrees for the Men's 90's and Women's tournaments on Friday, but friendly, cloudy skies and warmer temperatures were the norm for the Men's Open tournament that was held on Saturday. 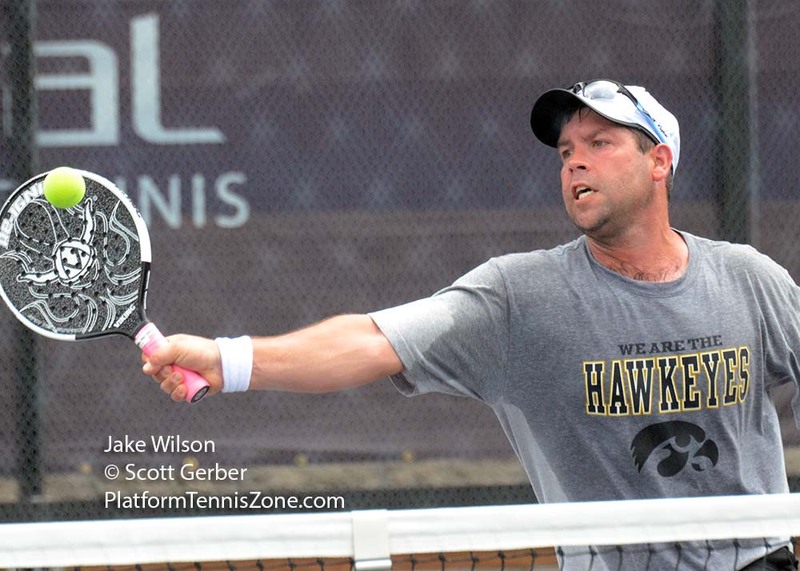 Scott Kahler and John Nichols of Pittsburgh won the Open Division by beating Columbus' Brian Heil and Mark Berry, 7-5, 7-5. 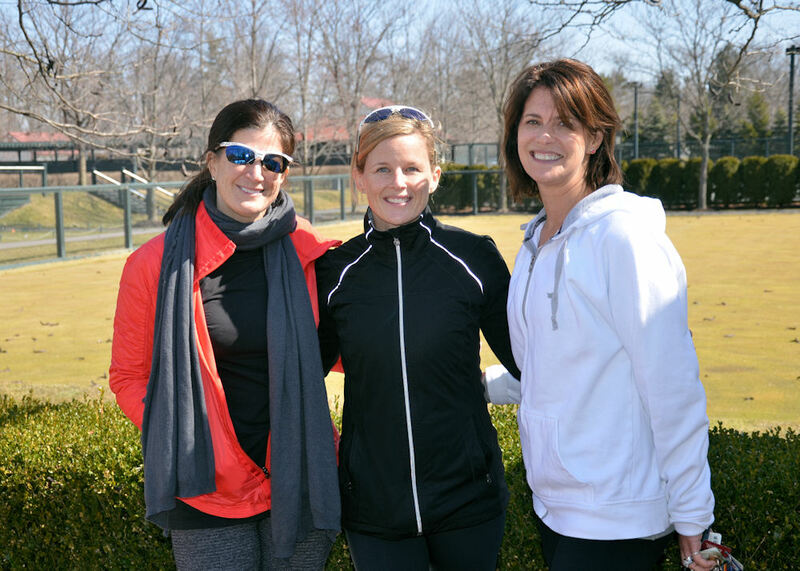 Columbus' Jill Gilbert and Dori Easdale won the Women's Division. They defeated Chagrin Fall's Meghan Trombold and Pittsburgh's Spencer Caravaggio in a 3-setter by the score of 6-1, 5-7, 6-3. 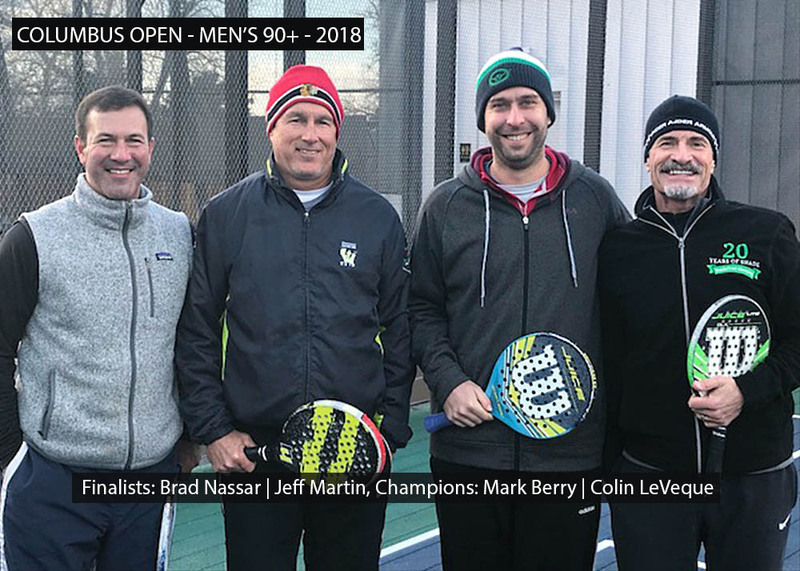 In the Men's 90's, Columbus' Mark Berry and Colin LeVeque became the champs by defeating Chicago's Jeff Martin and Brad Nassar in the finals. Click on the photos on the right to enlarge them. Player names are included. 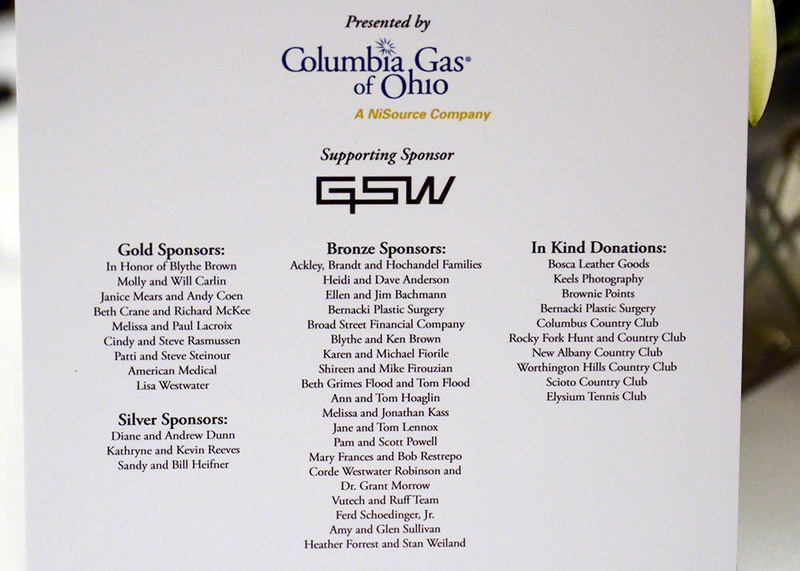 Lunch for both of the men's tournaments was held at Scioto Country Club. Elysium hosted the lunch for the women's tournament. 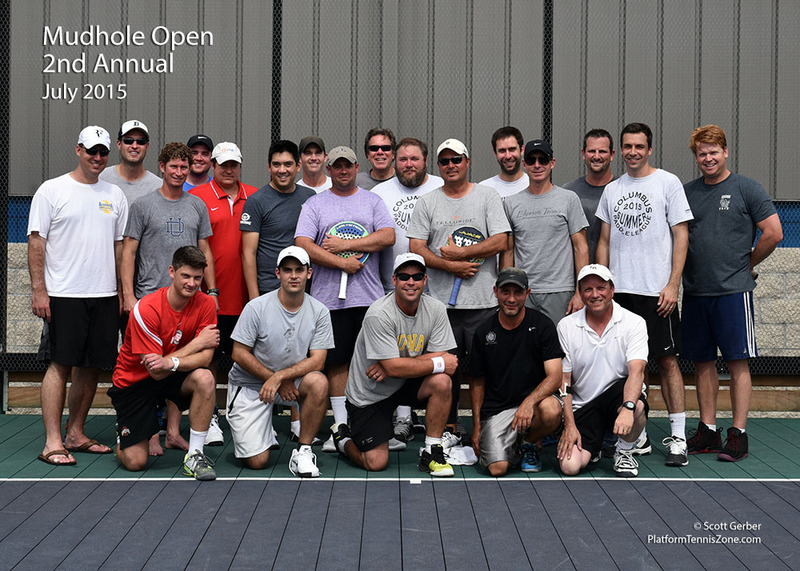 There were 19 teams in the Men's 90's and 21 teams in the Men's Open division. The host clubs were Scioto Country Club and Elysium. 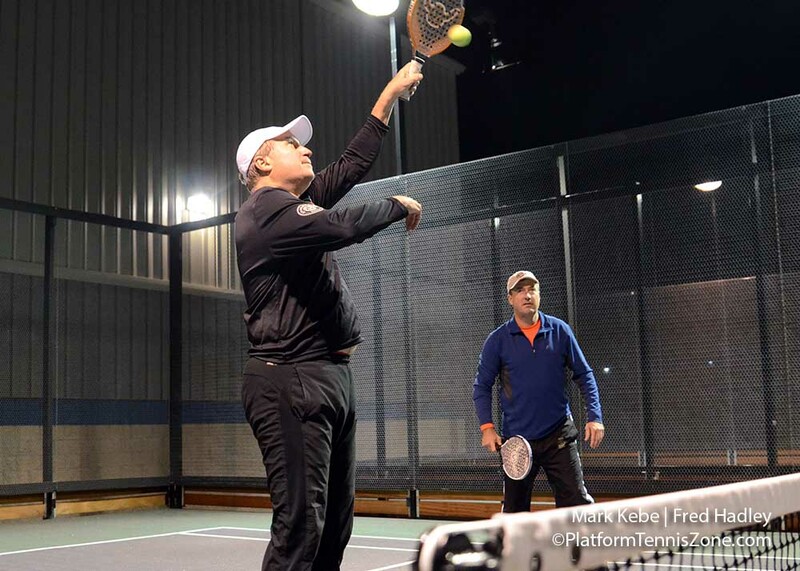 Other clubs that graciously donated their courts for the tournament included: Worthington Hills Country Club, Swim & Racquet Club, and Rocky Fork Hunt and Country Club. The league takes a break due to the upcoming Christmas and New Year's holidays. After the sixth week of play, New Albany and Worthington Hills are tied for the lead in the 4.0 League. New Albany beat Worthington Hills at their home match on November 5th by the score of 2-1, and WHCC returned the favor on December 16th by beating New Albany by the same score. Both teams have 5-1 records. Swim & Racquet 4.0 is in third place. In the 3.0 League, Lakes and New Albany are tied for the lead. They are both 3-2. Click to view the records of all of the teams. There have been 109 players who have competed thus far (and there are likely more than that since some line-ups have been incomplete). League play will resume on January 7th. 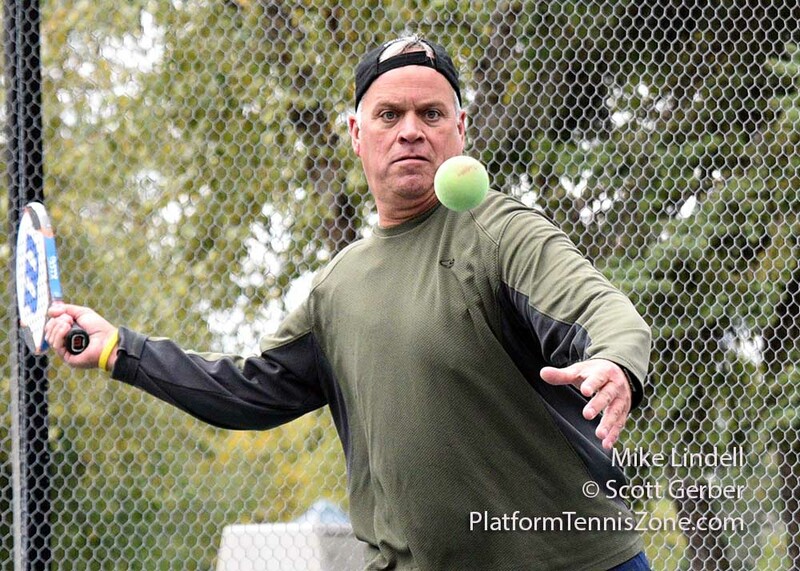 The platform tennis league will begin play on Sunday, November 5. There will be teams from Elysium, Lakes, New Albany, Scioto, Swim & Racquet, and Worthington Hills. The nomenclature was changed this year from "B" and "C" leagues to 4.0 and 3.0 leagues, respectively. Players will likely range from 4.5-3.5 in the 4.0 league and 2.8-3.5 in the 3.0 league. In years to come, there will likely also be 3.5 and 4.5 leagues. 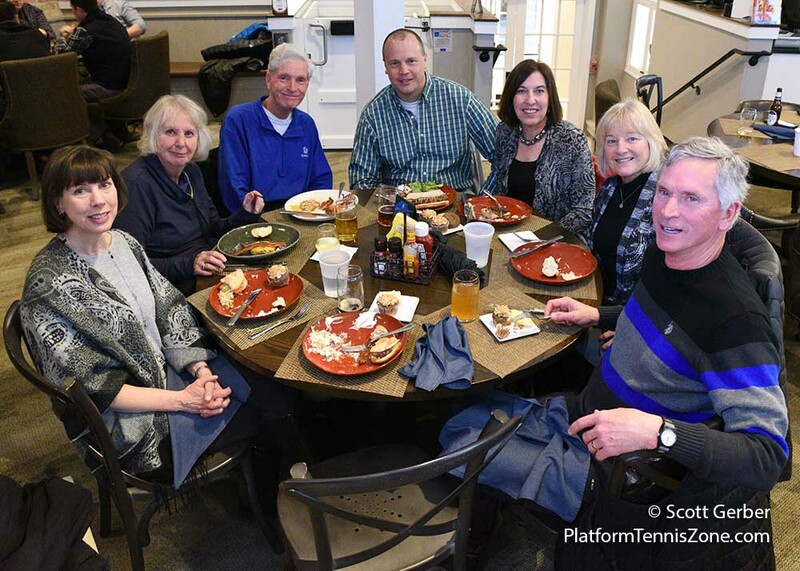 To kick-off the season, there was a cleverly named, Central Ohio Platform Tennis Kick-off Party held at Lakes Golf and Country Club on Sunday, October 29. Attendance was good with 25 players. 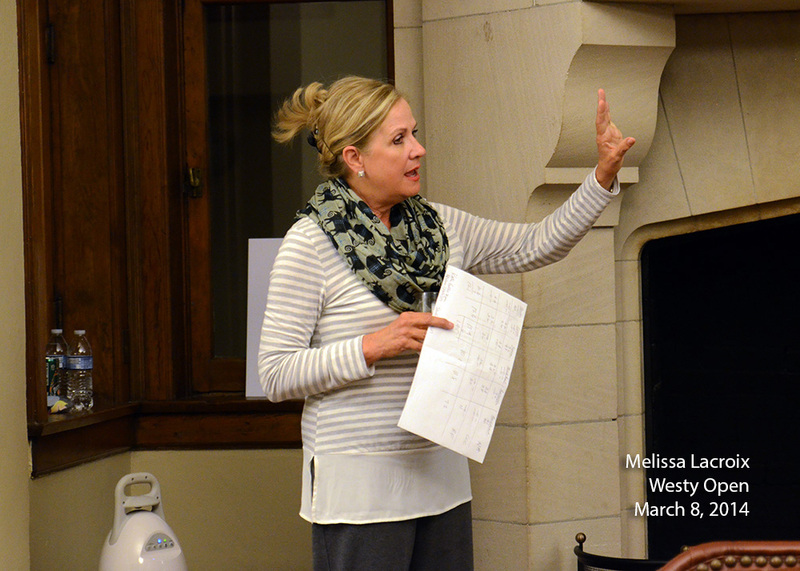 The 3.0 players competed from 1:00-2:30 under the guidance of Michelle Jarrett and Colin LeVeque. The 4.0 group played from 2:30-4:00. There were adult beverages and chips. The team information is still being setup, but click to see information about the various teams: Elysium 4.0, Lakes 3.0, Lakes 4.0, New Albany 3.0, New Albany 4.0, Scioto 3.0, Scioto 4.0, Scioto 3.0, Scioto 4.0, Swim & Racquet 3.0, Swim & Racquet 4.0, Worthington Hills 3.0, and Worthington Hills 4.0. To follow all of the action, click on League Information. 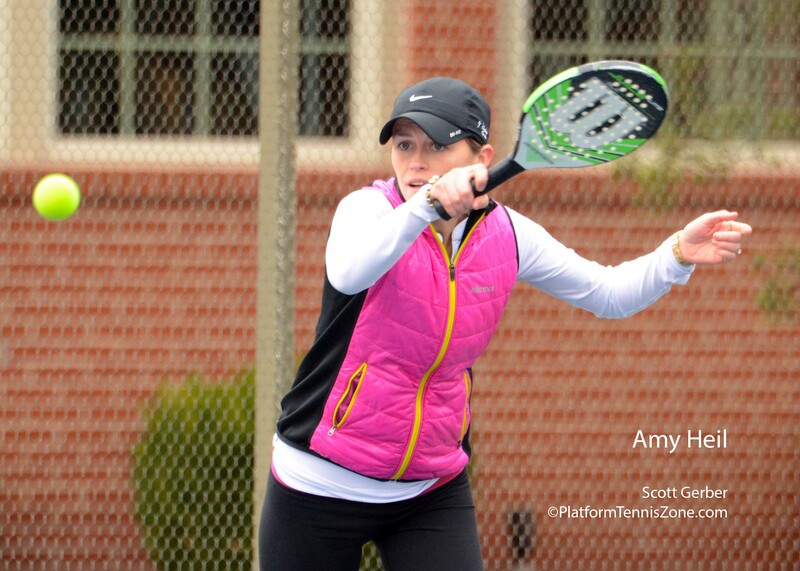 For those familiar with the OhioTennisZone.com web site, this web site will now utilize much of its software. 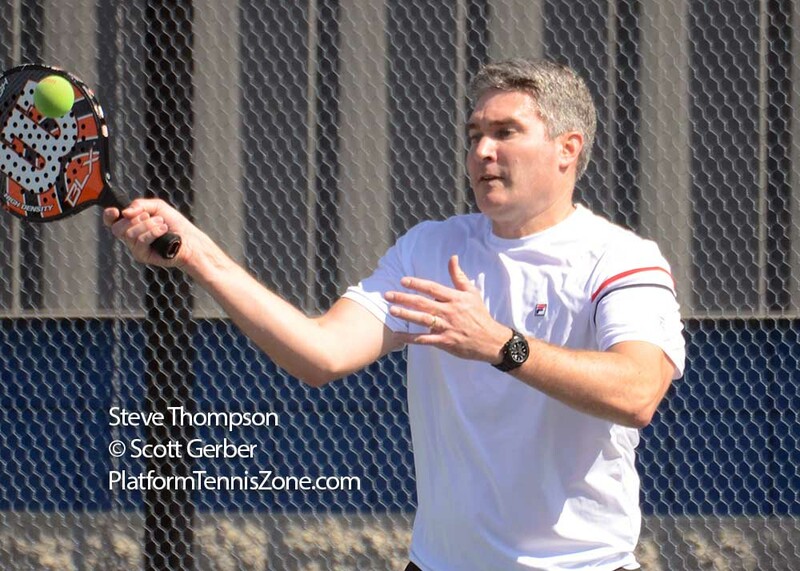 The OhioTennisZone web site primarily covers Ohio high school tennis on a state-wide basis. 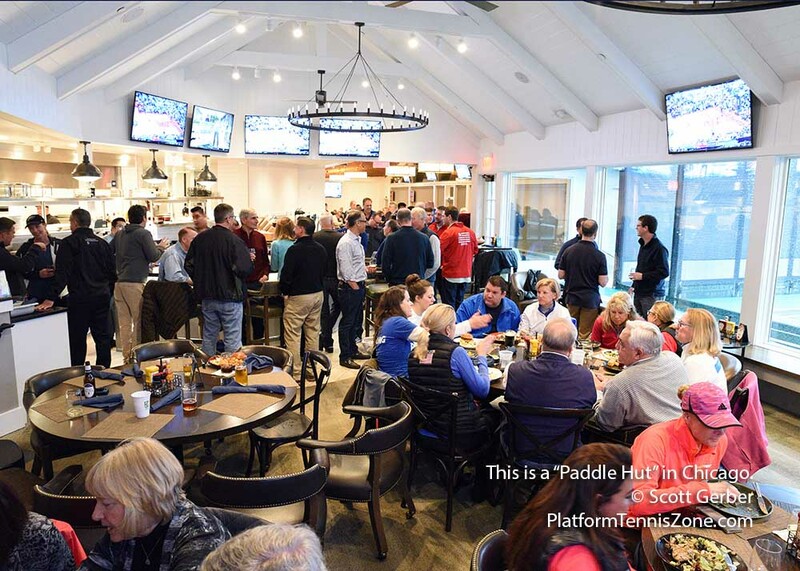 Elysium is having their second annual Paddle Fest on Sunday, October 1. The fun begins at 10:00am and the event concludes at 4pm, but players can come at any time during the event and leave when they wish. There is no cost to participate and the event is open to players of all skill levels and genders. 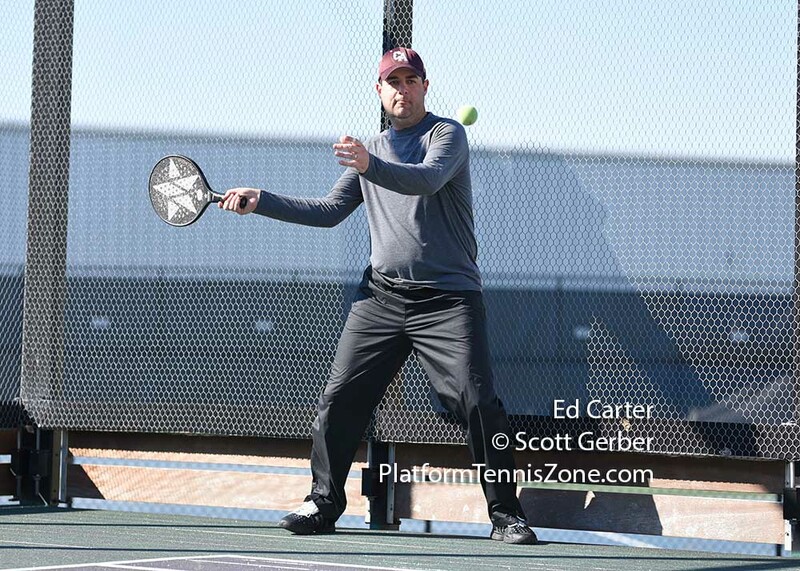 The exhibition will include APTA professionals: Brian Heil, Denny English, Klint McEnery, and Kevin Hornik. Contact Elysium at 614-873-8749 to participate in a clinic. 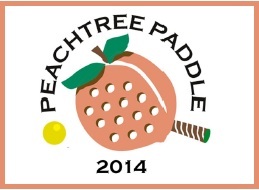 For more information, click on Elysium Paddle Fest. 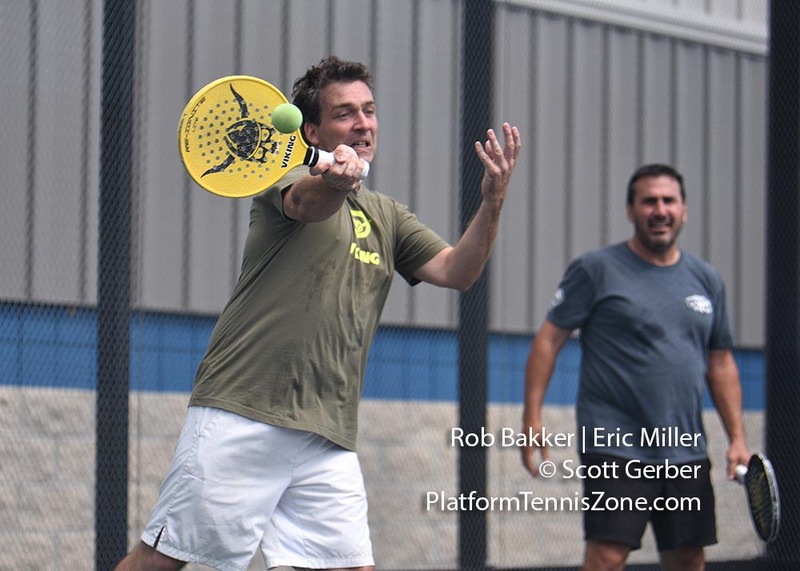 Elysium's 4th Annual "Battle at the Mudhole"
Sure it's summer but that doesn't mean that there shouldn't be a platform tennis tournament. Elysium held its fourth annual Battle at the Mudhole Tournament on a hot, sunny day. The draw included top players (and not so top players) from Ohio, North Carolina, Indiana, and Pennsylvania. Thanks to the use of low bounce balls, there were very few balls that were hit out of play, and there were still plenty of evil drop shots effectively executed. 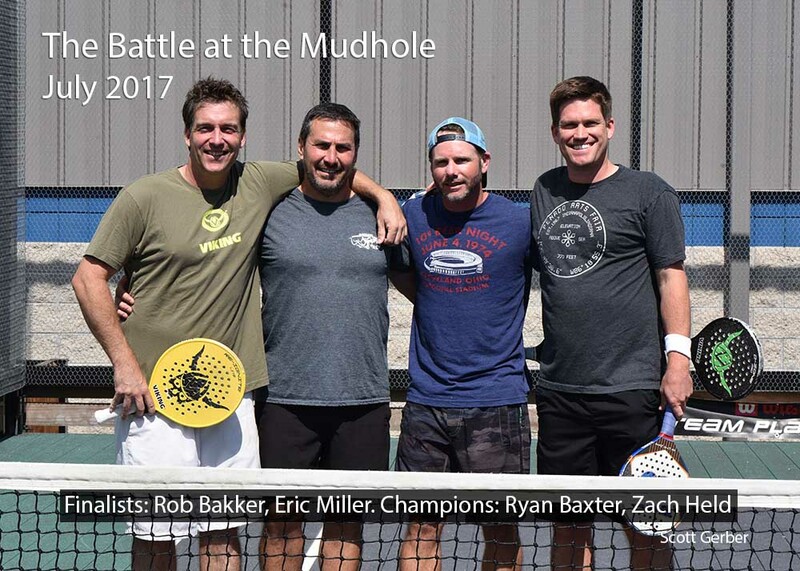 Ryan Baxter and Zach Held (Indianapolis) defeated defending champions Brian Heil and Mark Barry (Columbus) in the semifinals and Rob Bakker (Cincinnati) and Eric Miller (Charlotte) in the finals to capture the 2017 Mudhole title. 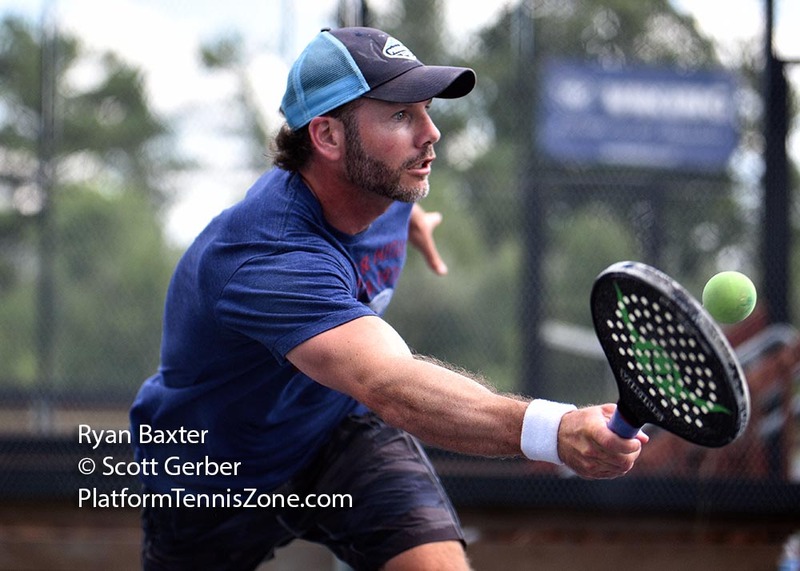 Bakker - Miller upset top seeded Scott Kahler (Pittsburgh) and Randy Lofgren (Charlotte) in three sets en route to the finals. Sponsors for the event were Shadetree and Rich Ihlendorf. The tournament is held each year on the Saturday following the July 4th holiday weekend. 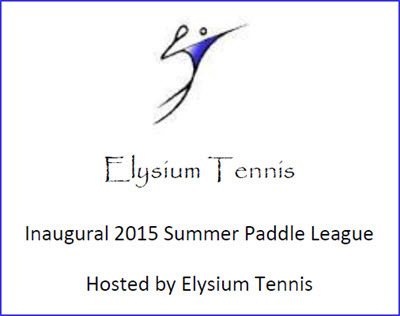 After last summer's success, the Elysium Summer League is now forming the league again for this summer. Those who want to participate need to act quickly and get their money into Elysium by May 1st. Before May 1: $75 for members and $100 for non-members. 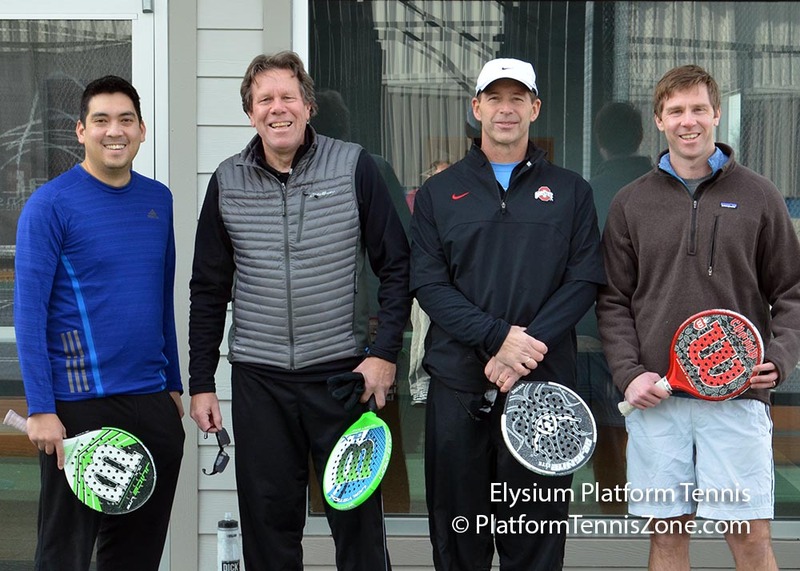 Those interested are to call Elysium's front desk at 614-873-8749 or contact Dan Morneau via email at dmorneau@elysiumtennis.com. Congratulations to the men of the Swim & Racquet team. 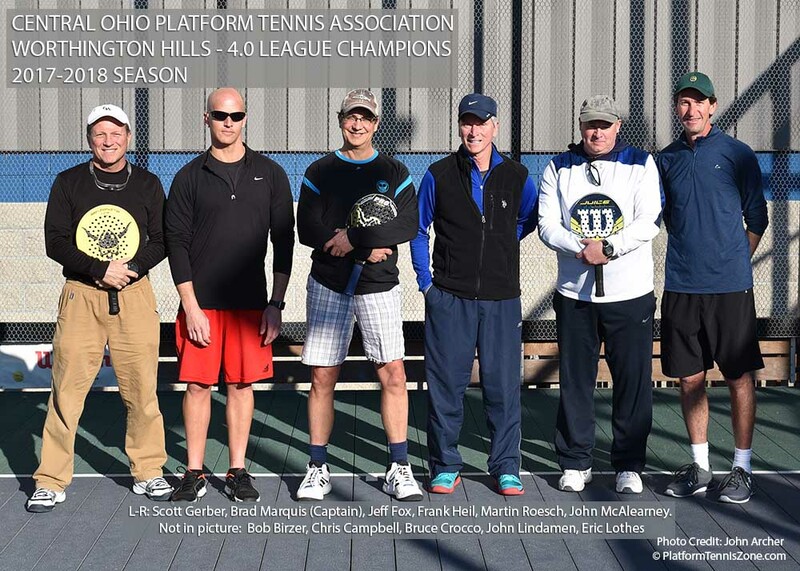 In just their second year, they won the Central Ohio Flight B league. Even though there were several close matches, they went undefeated during the season. Even more importantly, Swim and Racquet provided quality beverages and snacks for their opponents. Rob Martin is the captain of the team. There was not a league MVP, but if there was, WHCC's Martin Roesch would receive consideration. 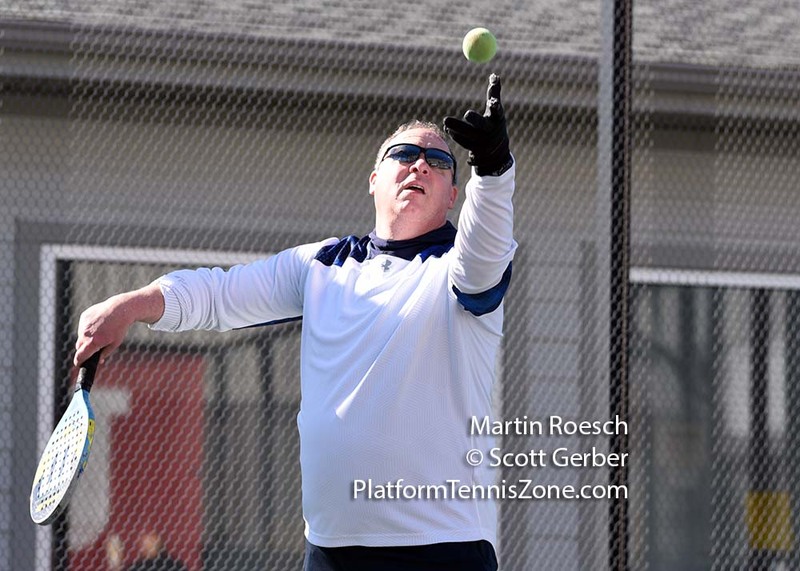 Special credit goes to Worthington Hills' Roesch for providing buffalo chicken dip for most of the WHCC home matches. Thanks to careful planning, there was rarely a chip / chicken-dip imbalance. 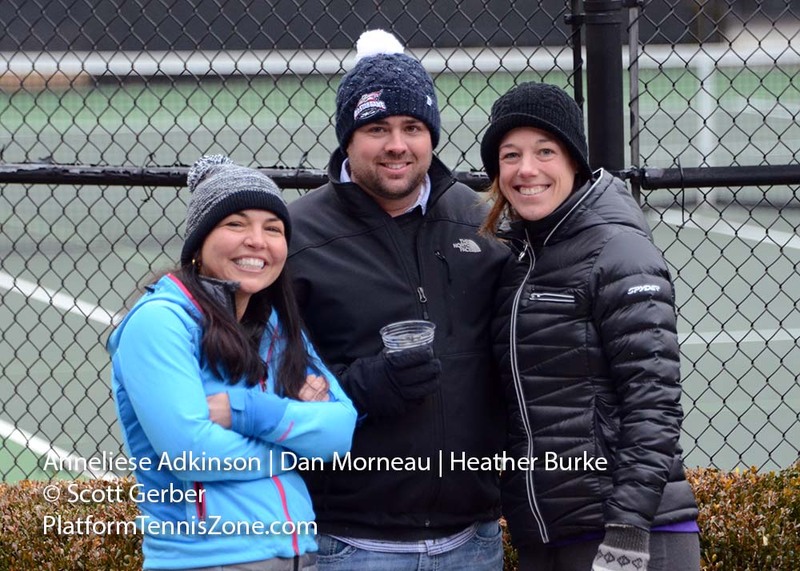 The Columbus Open took place on February 3 for the Women's Open and the Men's 90's. 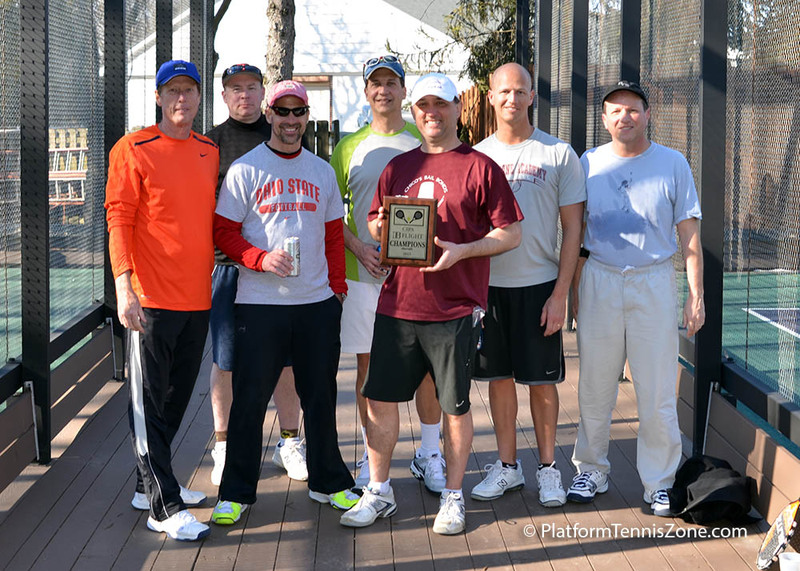 The Men's Open was played on Saturday, February 4. The Women's Open was won by Sarah Lynch and Carla Lavrusky from Pittsburgh. They beat Columbus' Michelle Jarrett and Pam Lippy in the finals. 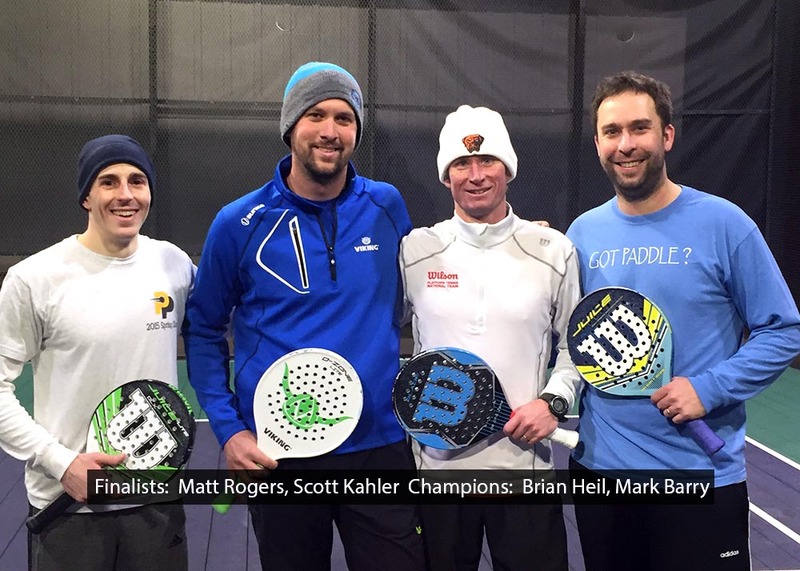 Columbus' Brian Heil and Mark Barry won the Men's Open by beating Pittsburgh's Matt Rogers and Scott Kahler. 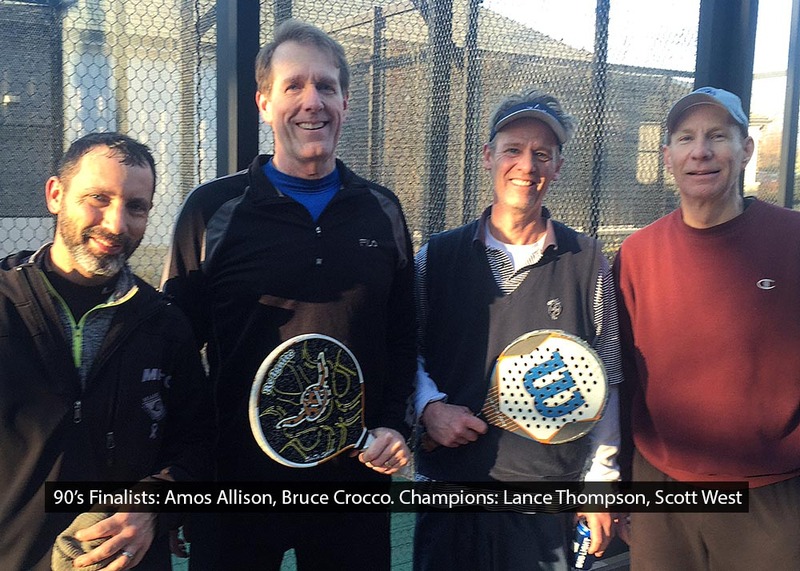 In the Men's 90's final, Lance Thompson and Scott West beat Amos Allison and Bruce Crocco. All are from Columbus. For more information, click Men's info and Women's info. 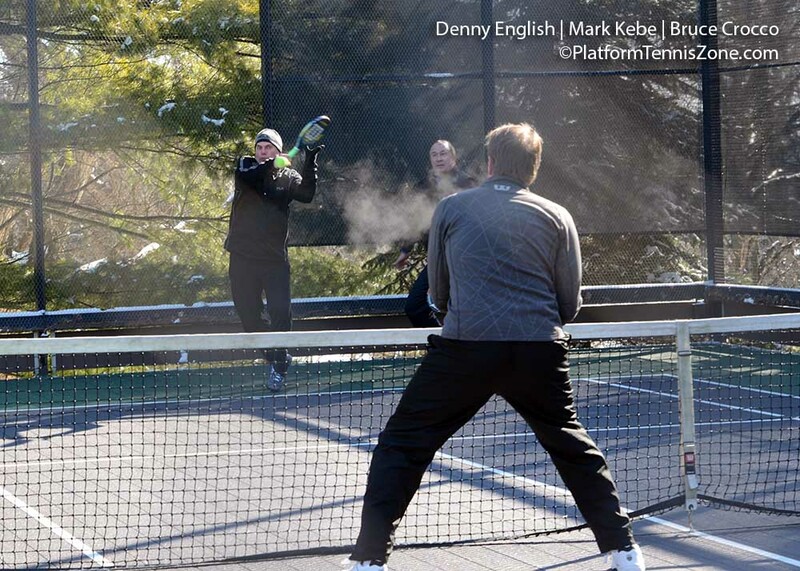 There are numerous platform tennis tournaments in the Midwest. Depending on the tournament, players come from far and wide to participate. 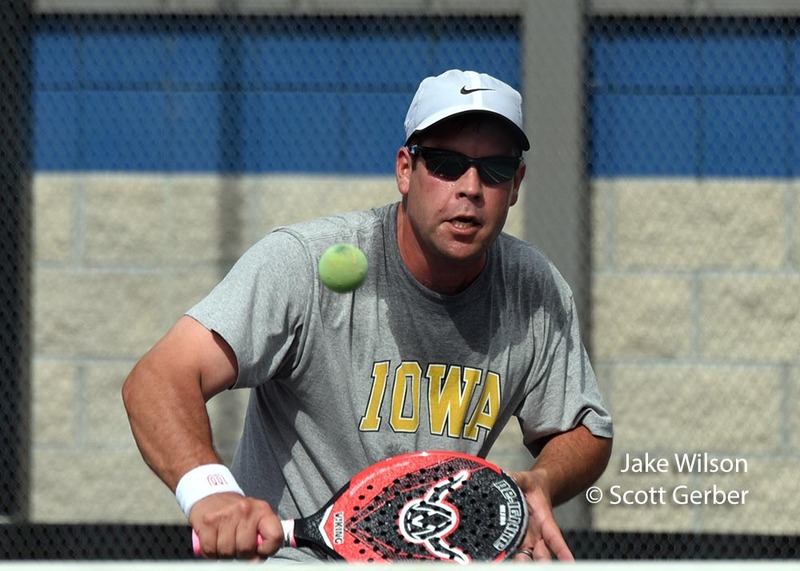 If the tournament has national ranking points, it becomes a national event, otherwise, the draws normally consist of players from contiguous states. 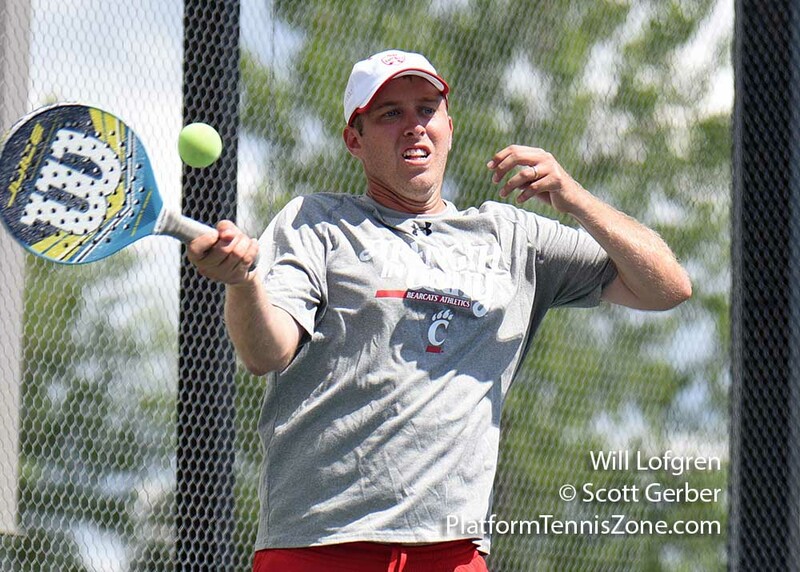 The Midwesterns is a major, national ranking point event, and it was held in Cincinnati over the weekend. The photos to the right are of several of the Central Ohio women who participated. 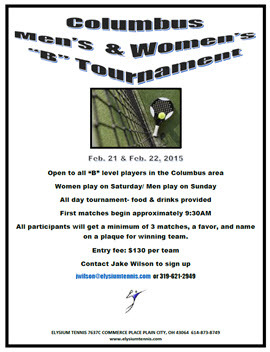 The Columbus Open will take place on February 3 for the Women Open and Men's 90's. The Men's Open will take place on February 4. For more information about the Columbus Open, click here for information on the Men's 90 and Open. Contact Brian Heil for any questions about the Women's Open. It's warm. It's cold. It's warm. It's cold. Well, you get the idea. 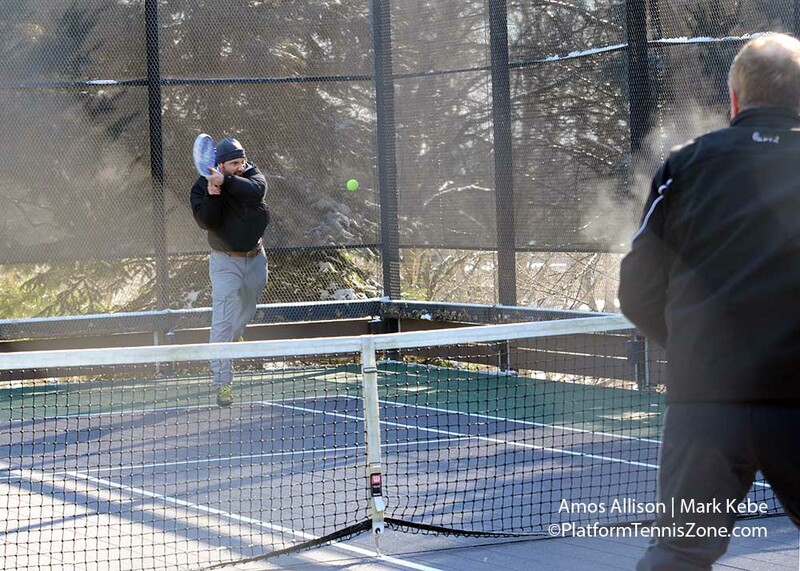 There were a few days of colder weather to take legitimate platform tennis photos so the camera gear braved the temperatures and I snapped a few photos at Worthington Hills. 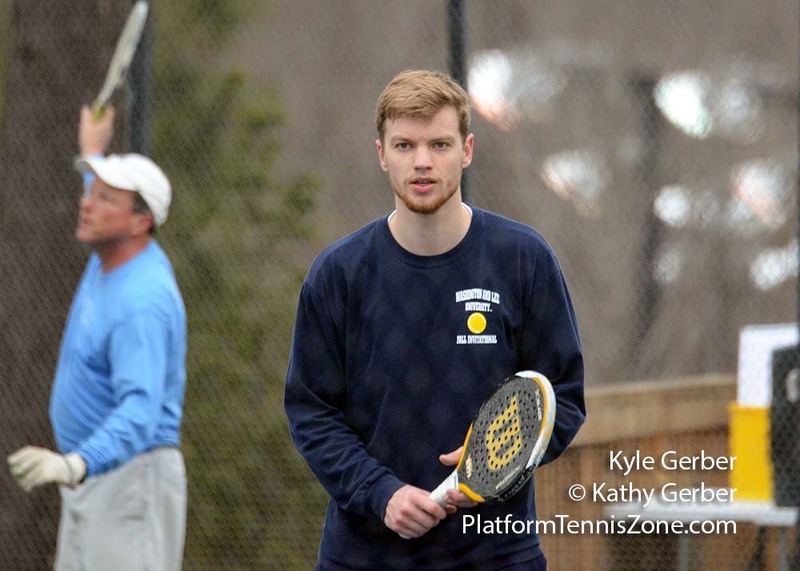 More photos will be posted soon that were taken at Swim & Racquet. 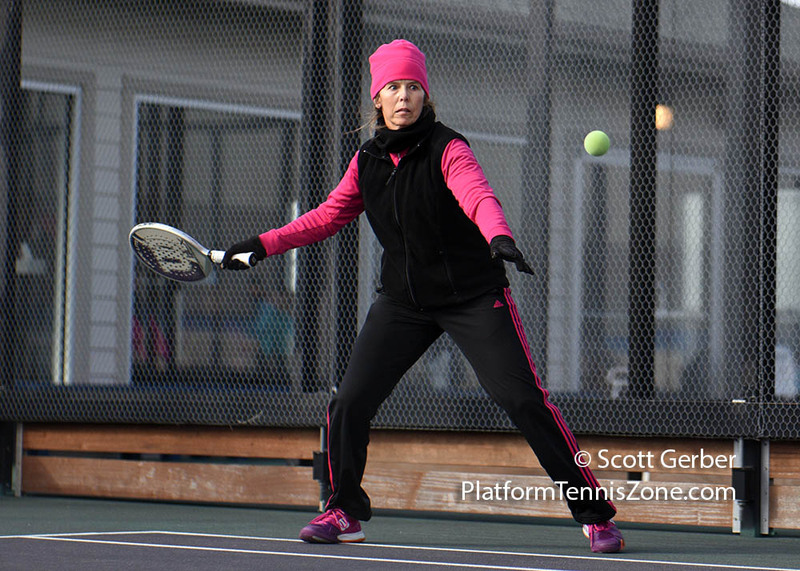 The platform tennis league is now in its second week. 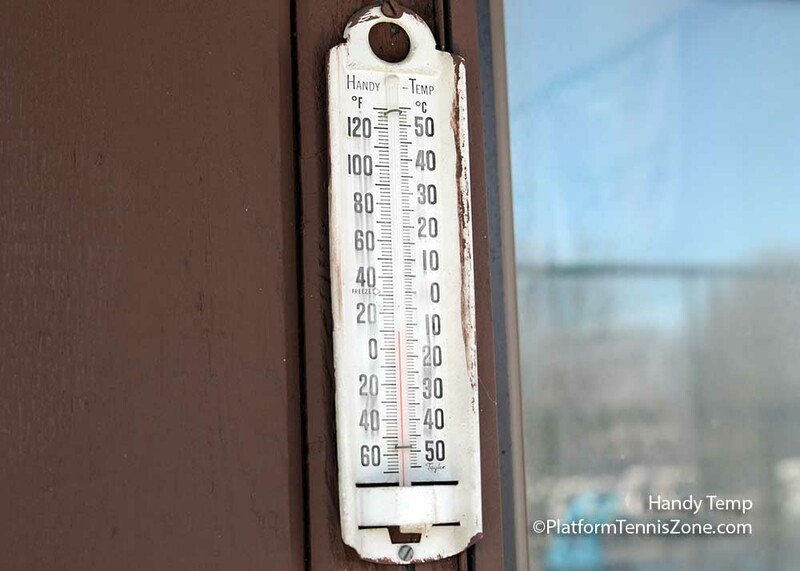 After horrible early-season warm temperatures, the teams finally started basking in 30 degree temps over the weekend. There are seven teams participating in Flight B this year. They are: Elysium, Lakes, New Albany, Scioto B-1, Scioto B-2, Swim and Racquet, and Worthington Hills. There is also going to be a C Flight this year. Teams from Lakes, New Albany, Scioto, and Swim and Racquet will participate in that league. Interested in playing in the men's league? Click for more information about the league. Most (but not all) people like to get better in anything that they frequently do. First though, it is important to know where a player stands in terms of ability. 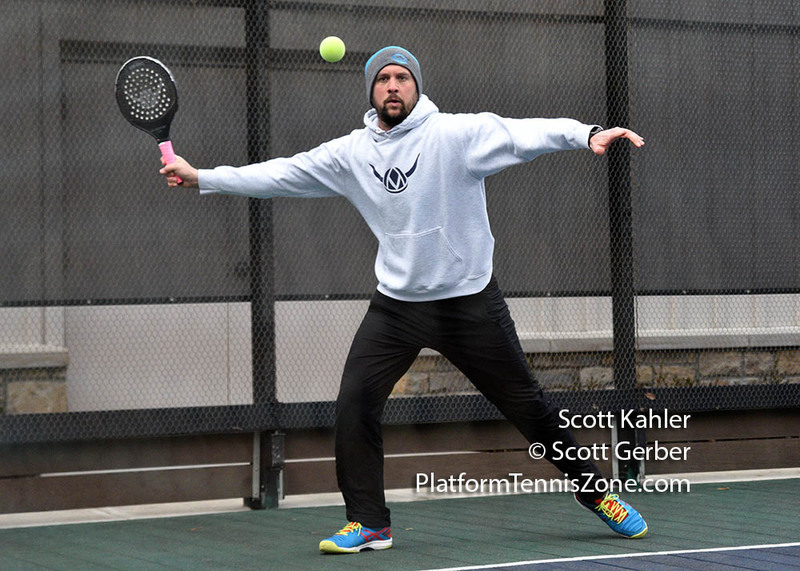 The American Platform Tennis Association (APTA) has developed a new tool that will help players assess their skills. 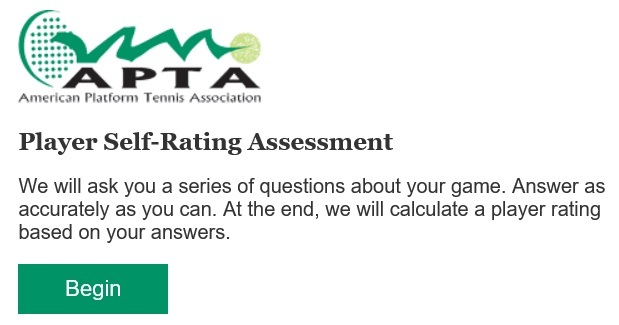 Click to access the APTA Player Self-Rating Assessment tool. For those who wish to improve, the ideal situation would be to complete this self-assessment and then discuss the various criteria with a pro to determine areas of agreement and/or disagreement. The pro could then suggest areas of improvement. For the die hard, summer PT players, Elysium's Mudhole Open offers the area's only summer tournament. It was held on July 9th. The champions this year were Brian Heil and Mark Barry. 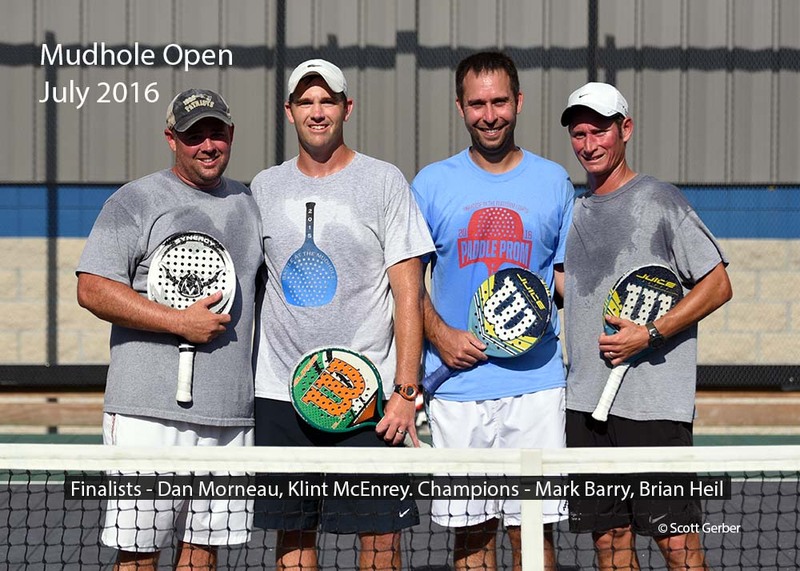 They defeated Dan Morneau and Klint McEnery in the finals. 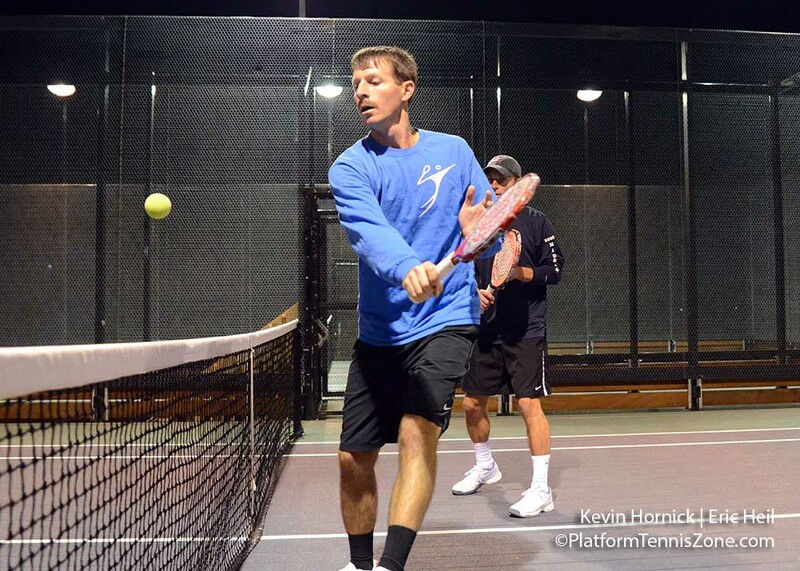 The Men's League is well underway and the season is in high gear. In the Flight A group, Elysium leads the league, followed by Scioto. Worthington Hills is first in Flight B and New Albany is in second place. 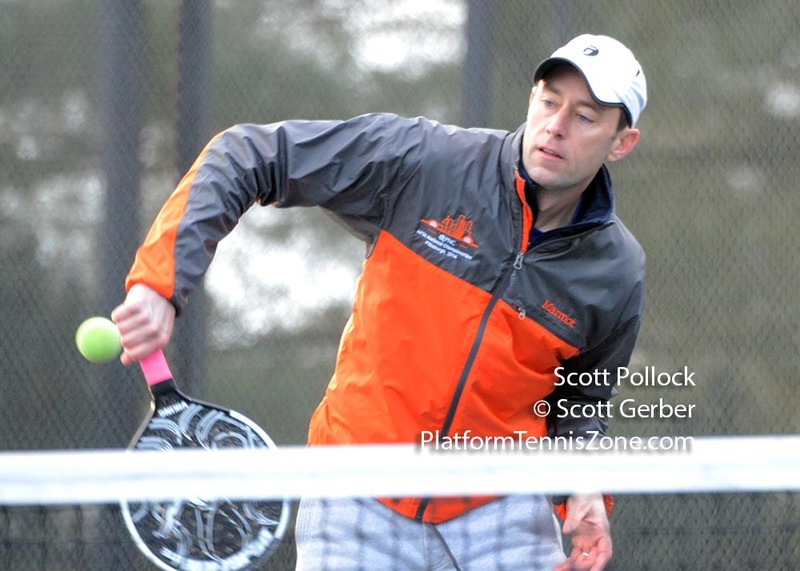 The warm weather early-on was a huge benefit for the two new teams, Swim and Racquet and Lakes. 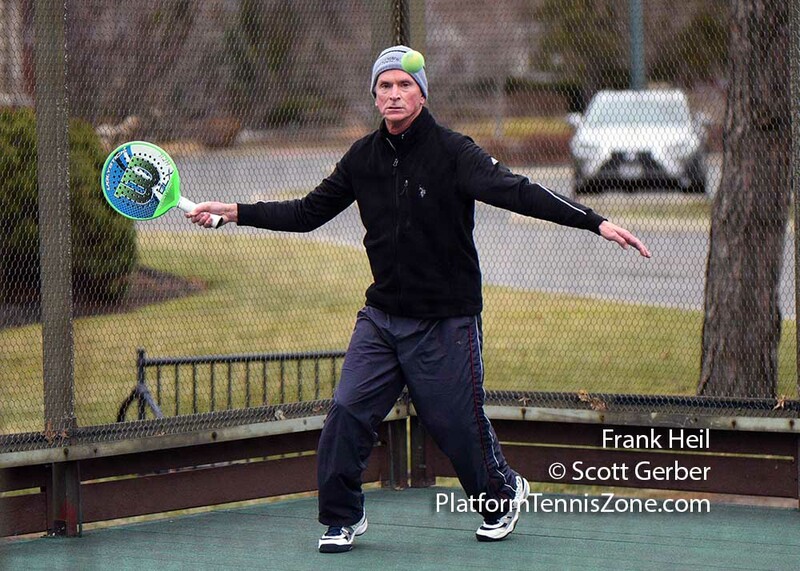 It is much easier to get players hooked on paddle while the weather is still moderate rather than when the temperatures are in the teens. 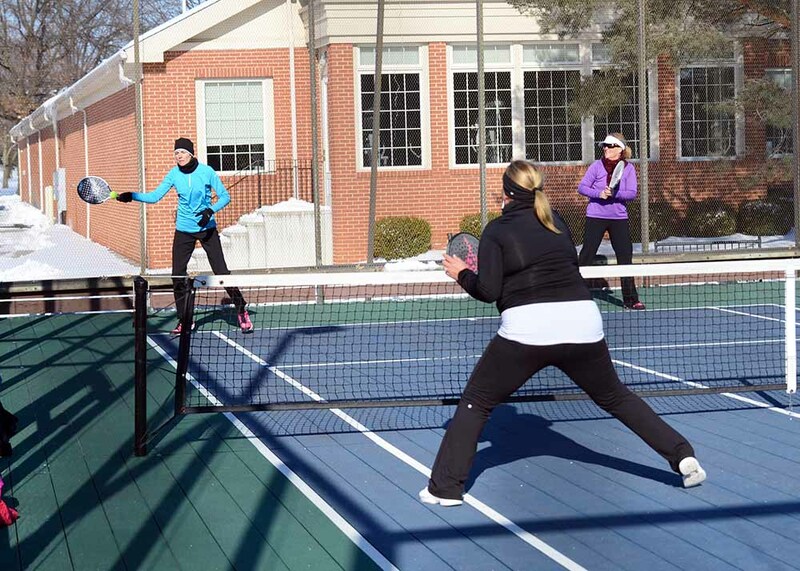 Swim and Racquet came on-board at the beginning of the season, and Lakes' courts were ready by mid-season. Both teams are already playing solid, competitive matches. 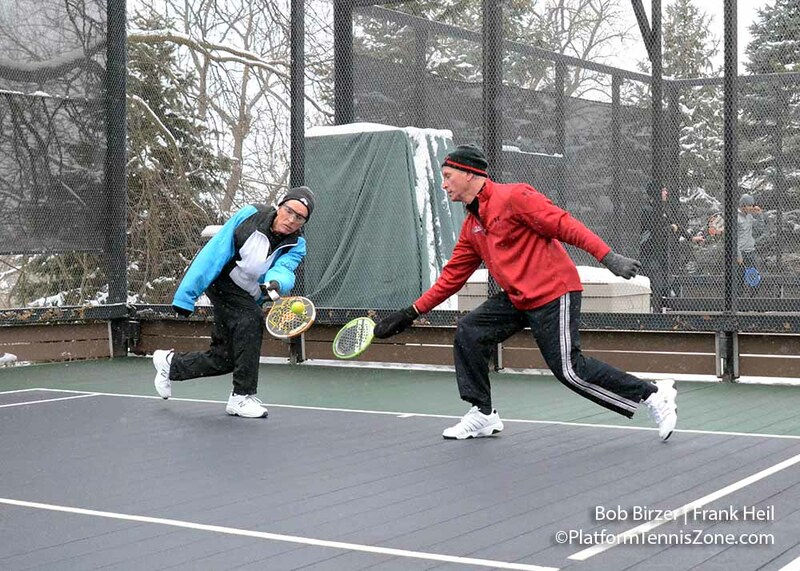 It is painful to include team photos of a winter sport when players are wearing shorts. The Lakes team was the first photo taken this season of players wearing winter gear. Interested in playing in the men's league? Click for more information about the league. Click to view the list of captains. 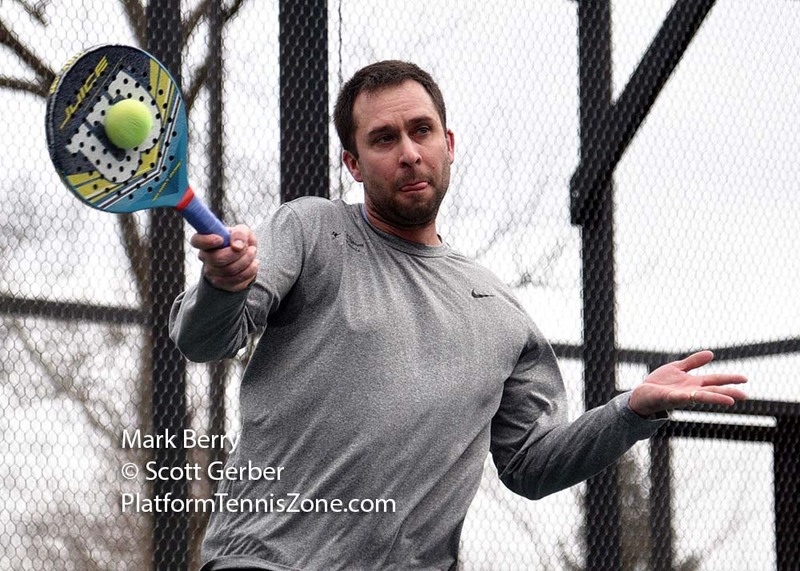 The Westy Open has turned into the Columbus-area platform tennis party. 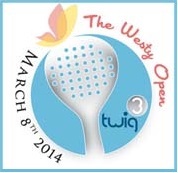 Click to sign-up for the Westy Open on February 27th. There are a variety of skill levels played at five clubs around town, and the Post-Party will take place at the The Fox in the Snow Cafe. League play kicks into gear this weekend. There will be four Flight A and eight Flight B teams. Both Scioto and Elysium will field two Flight B teams. 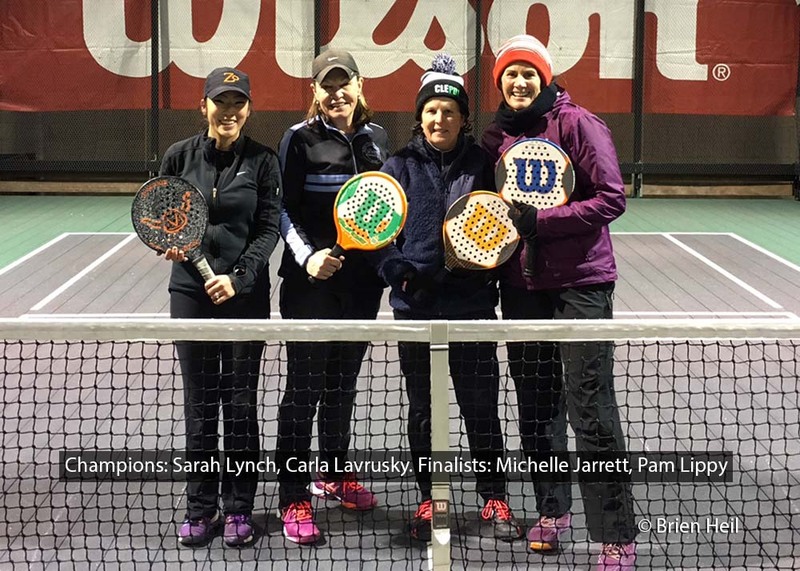 Swim & Racquet is new to the league this year and they will offer a Flight B team. Rocky Fork and Lakes will be teaming up to form both Flight A and Flight B teams. This is the fourth year for the league. Last year's team champions were Elysium A and Scioto Country Club B1, and they were captained by Paul Ghidotti and Robbie Columbo, respectively. The women's league is in the process of gathering players for its second season. Contact Jake Wilson for more information. 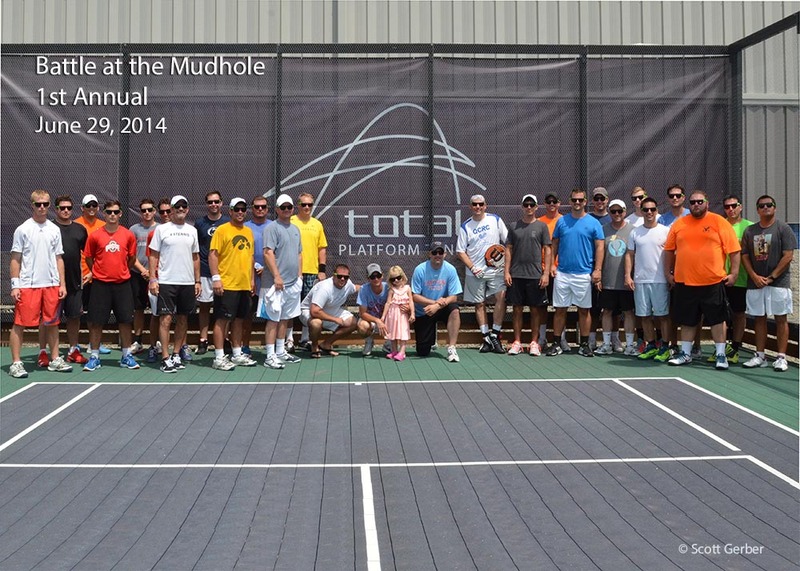 On a rare, hot sunny day in central Ohio, 16 teams competed for the coveted Mudhole Open championship hosted by Elysium Tennis. 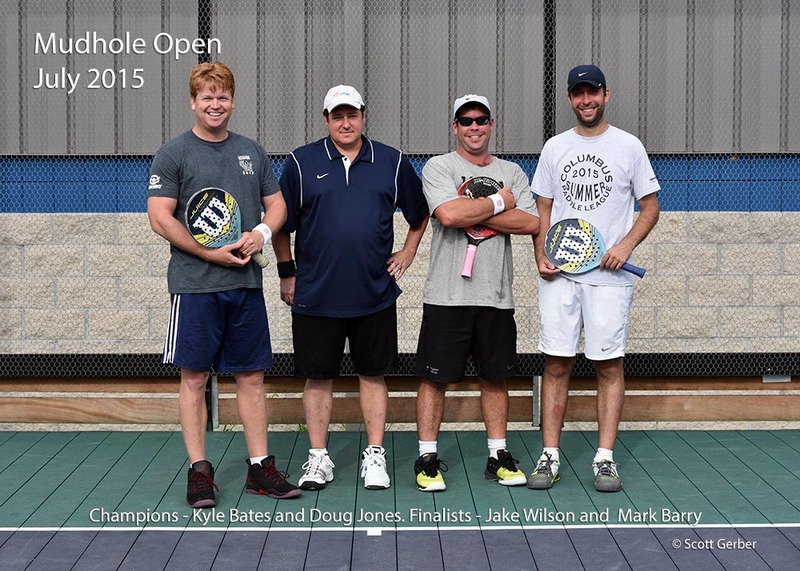 Doug Jones and Kyle Bates defeated Jake Wilson and Mark Barry in the finals by the score of 6-3, 6-2. 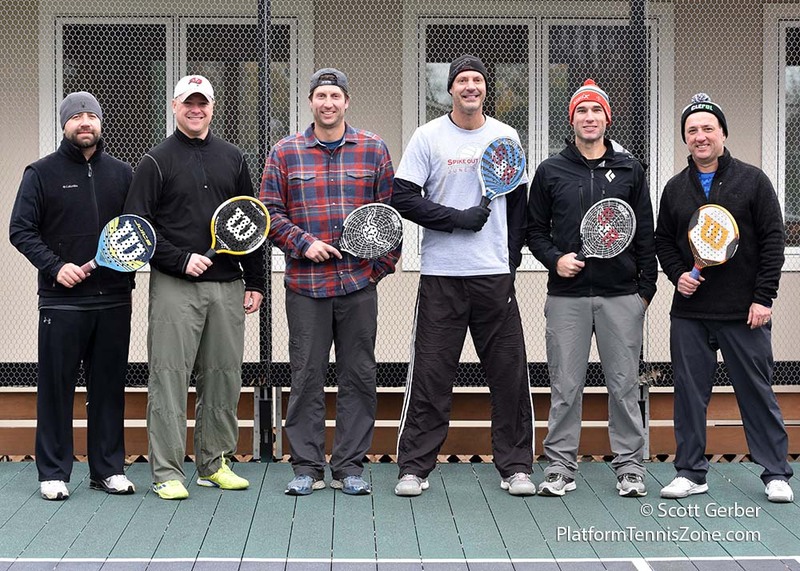 To get into the finals, Jones and Bates defeated Dan "Dale" Morneau and Klint McEnery, and Wilson and Barry beat Denny English and Balazs Novak. 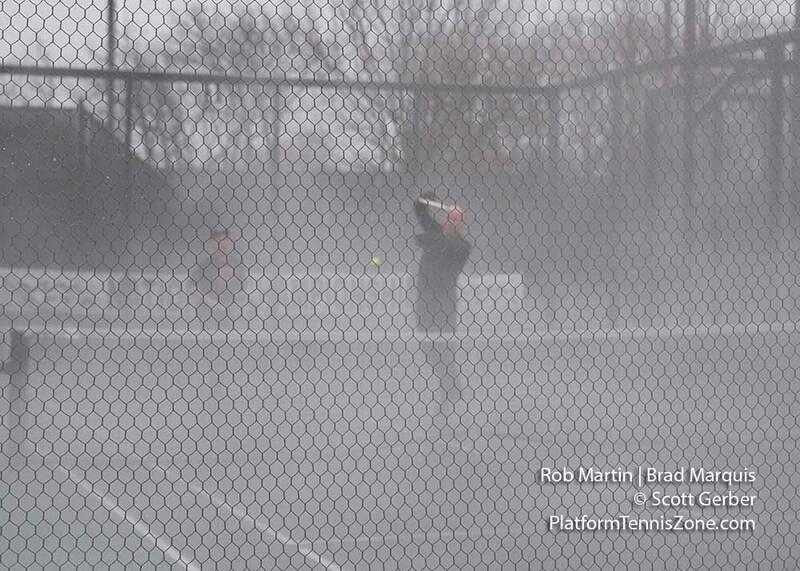 The Mudhole turned out to be a great promotional event for platform tennis. 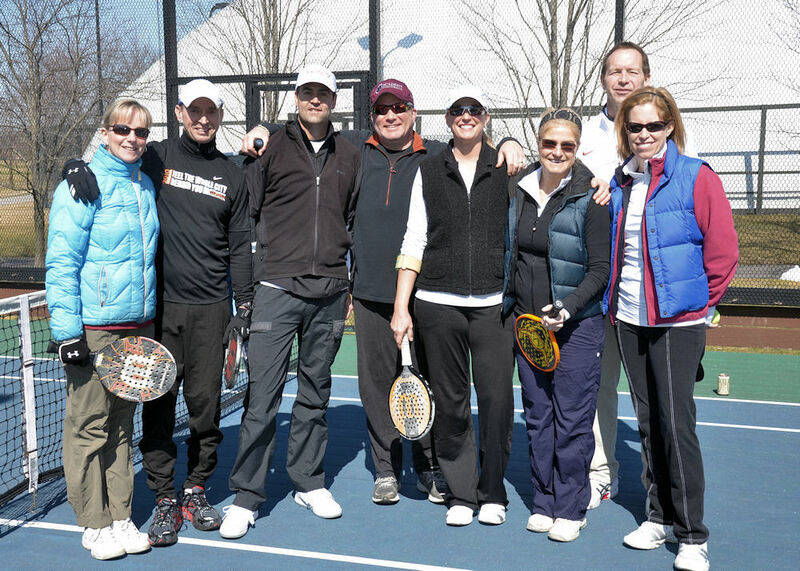 At the same time as our tournament was being played, the Bernard Master Doubles Tennis Classic took place at Elysium. 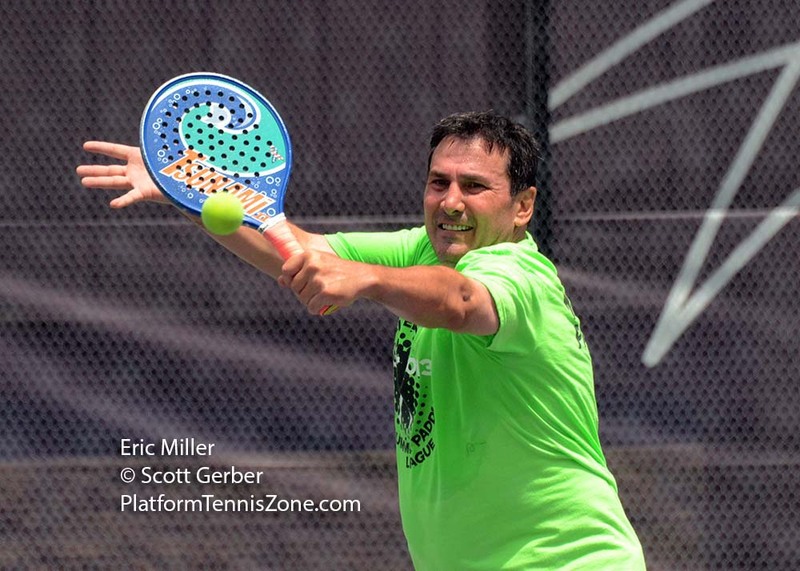 This enabled many tennis players to watch competitive platform tennis for the first time. Elysium is holding its second annual Mudhole Open on Saturday, July 11. This was a great tournament last year and you can expect to have the same amount of fun at this summer's tournament. Paddle season doesn't have to end when the temperatures exceed 50 degrees. Elysium is hosting the Columbus-area's first summer league this year. Matches are played on Tuesday nights between May 5th and September 1st. The league will include male and female players, and it will include players of all skill levels. To get involved, contact Elysium as soon as possible but before April 30th at (614) 873-8749. Click to read more about the league and the league costs. There will be six teams, and four teams will play each week at either 8pm or 10pm. To help insure that the teams are of similar ability, captains will draw for players at the Draft Party on May 2nd. Contact Elysium's Brian Heil or Jake Wilson with any questions. 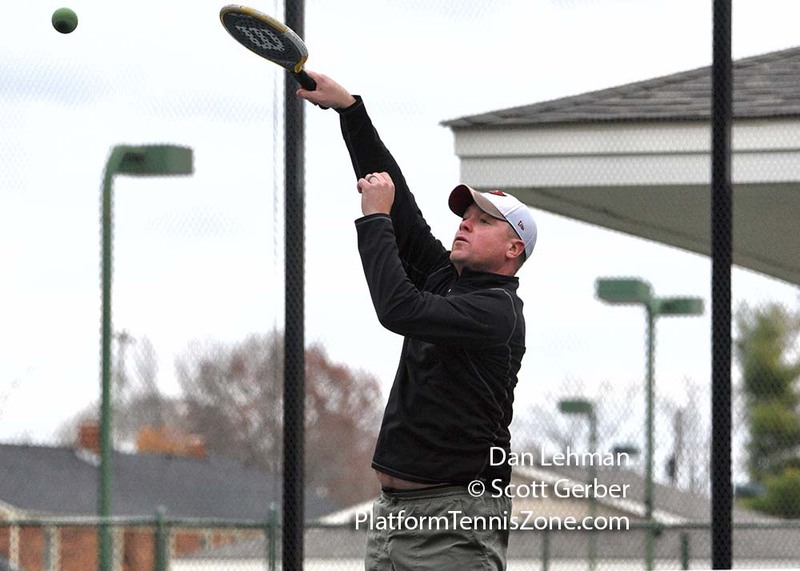 It was Elysium Tennis and Scioto Country Club in both of the finals of the Columbus Interclub Platform Tennis League. 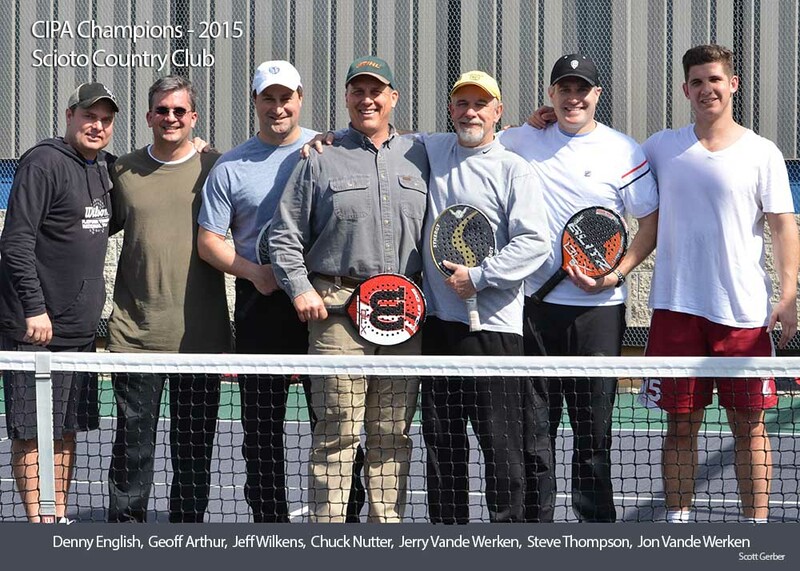 Elysium took the Flight A championship - winning in a close match against Scioto Country Club. In the Flight B championship, Scioto Country Club B1 won the crown - beating Elysium in the finals. Elysium's Flight A Team was captained by Paul Ghidotti. 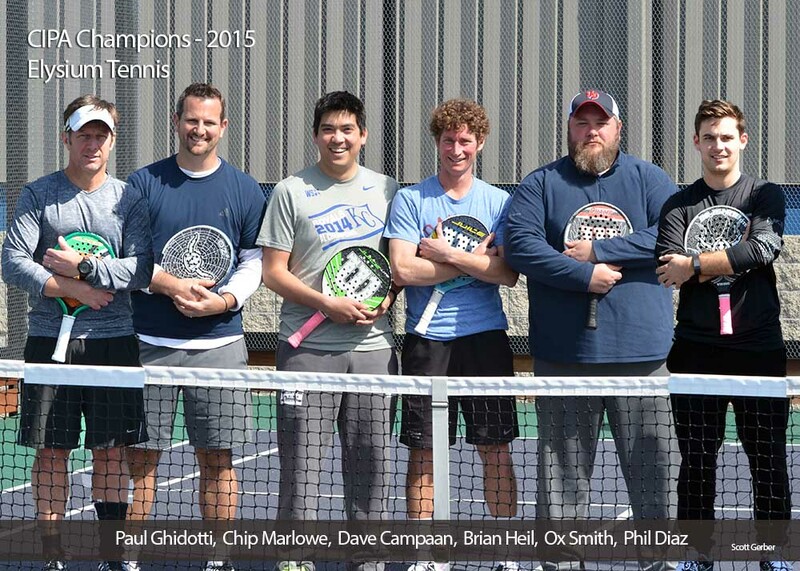 The other participants on the championship team were Philip Diaz, Brian Heil, Chip Marlowe, Ox Smith, and Dave Campaan. Scioto had two Flight B Teams. The Flight B champs were captained by Robbie Columbo. Other members of the team were Scott Thompson, Jeff Wilkens, Geoff Arthur, Jon Vande Werken, Chuck Nutter, and Jerry Vande Werken. 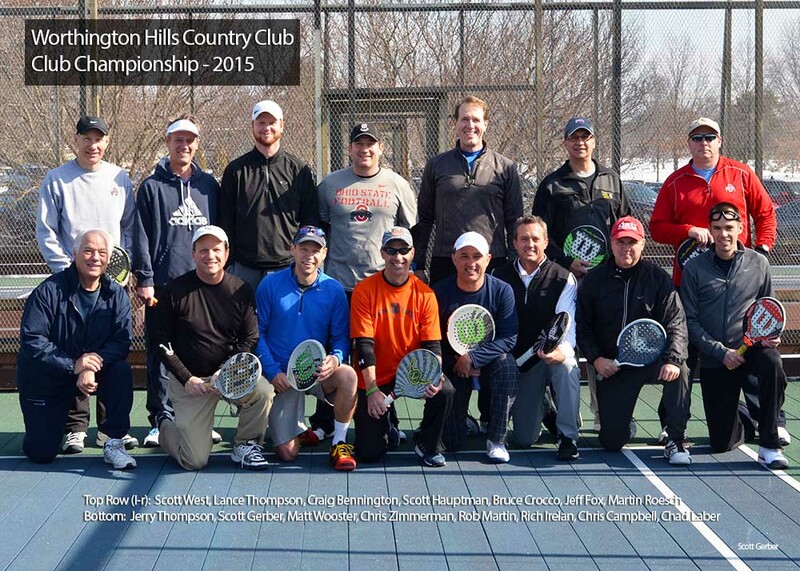 Worthington Hills had its annual club championship on March 8th. The weather was perfect for fans, but a bit warm for the players. This year's club champions are Lance Thompson and Scott West. 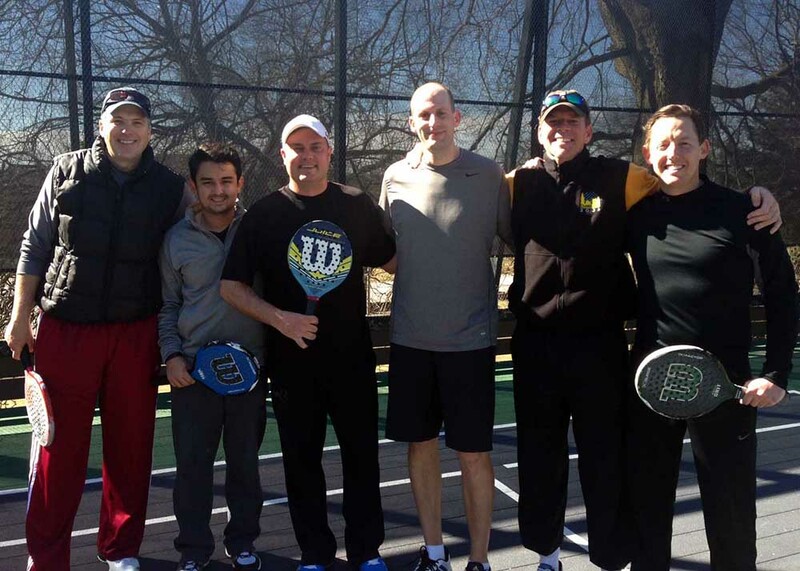 They defeated last year's champs, Craig Bennington and Scott Hauptman, in three sets. Matt Wooster and Chris Zimmerman came in third. 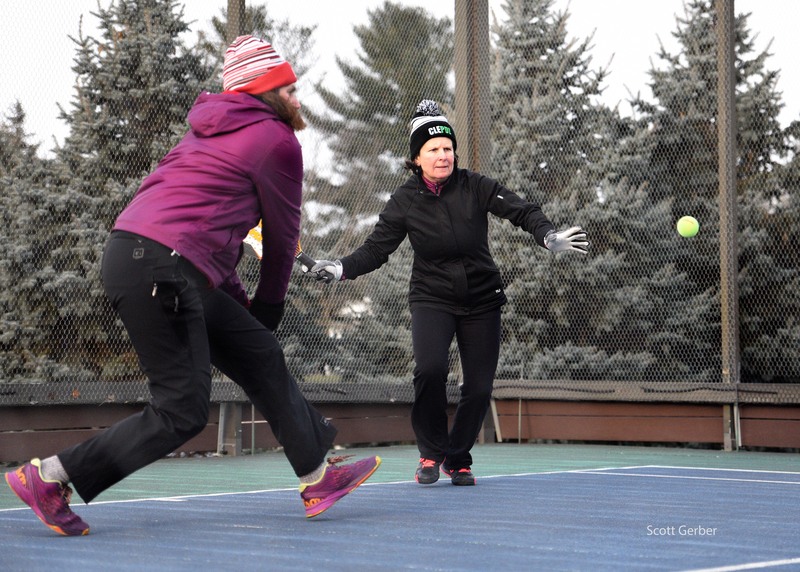 It took a few minutes for players to become acclimated to the single digit temperatures, but players quickly warmed up to make the 14th annual Westy Open another success. 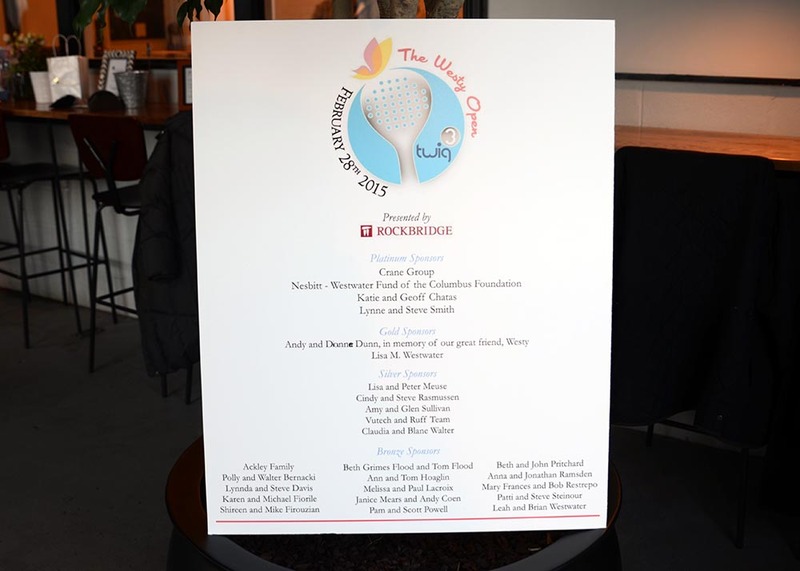 Over $70,000 were raised by TWIG 3 to benefit Nationwide Children's Hospital Behavioral Health Program. 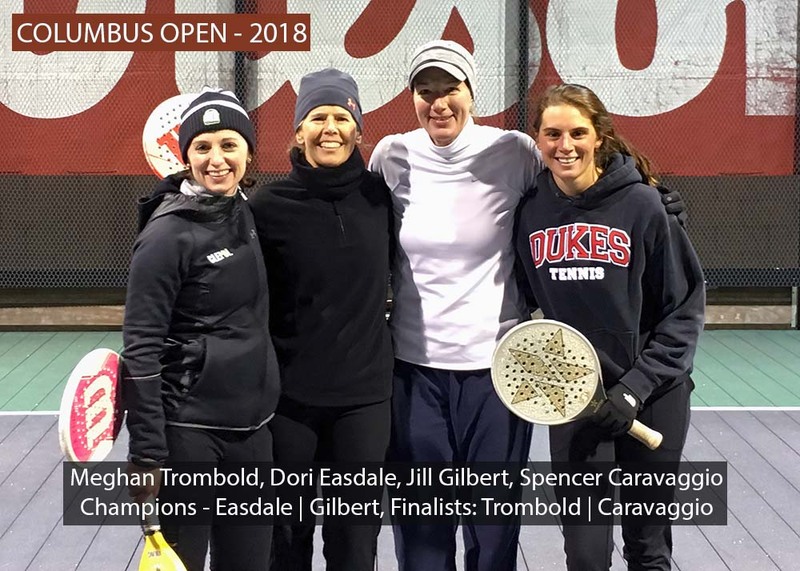 The co-ed tournament included over 90 players and the matches were played throughout Columbus at the following clubs: Columbus Country Club, Elysium Tennis, New Albany Country Club, Rocky Fork Hunt Club, and Worthington Hills Country Club. 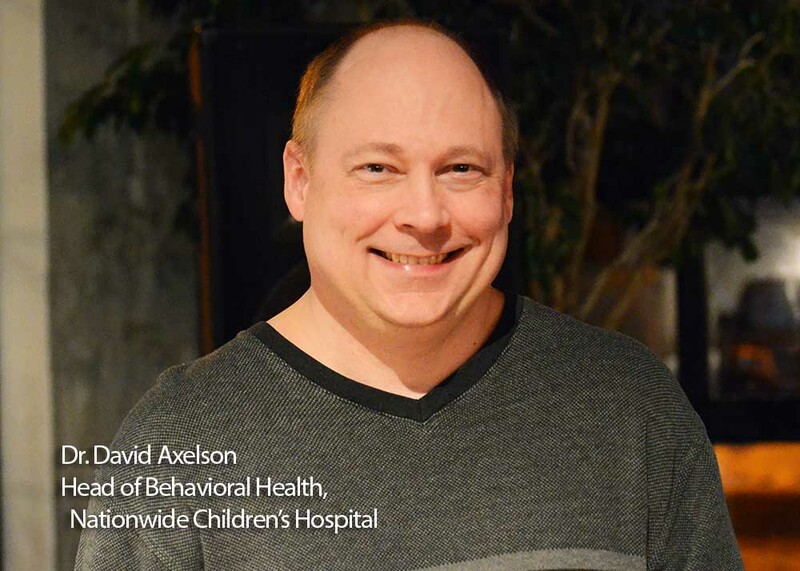 Dr. David Axelson, of Nationwide Children's Hospital, provided his thanks for the group's generosity at the after-party. The after-party was held at The Fox in the Snow Cafe. 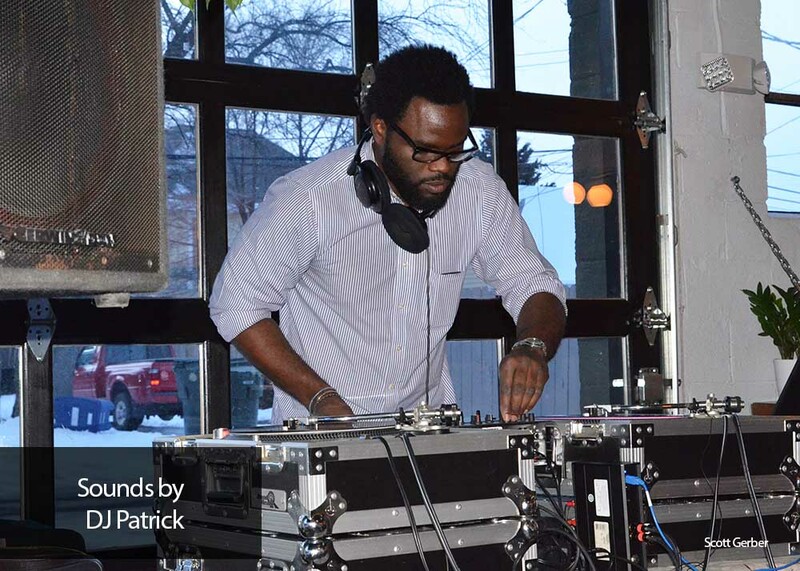 Music was provided by DJ Patrick. 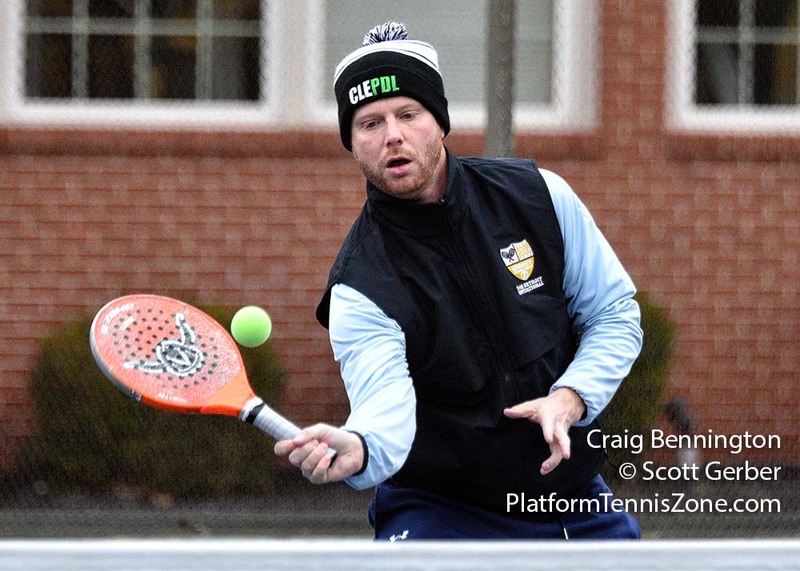 There were a number of Columbus area teams that avoided the eight inches of snow on Saturday by playing in Atlanta's 10th Annual Peachtree Invitational Tournament. 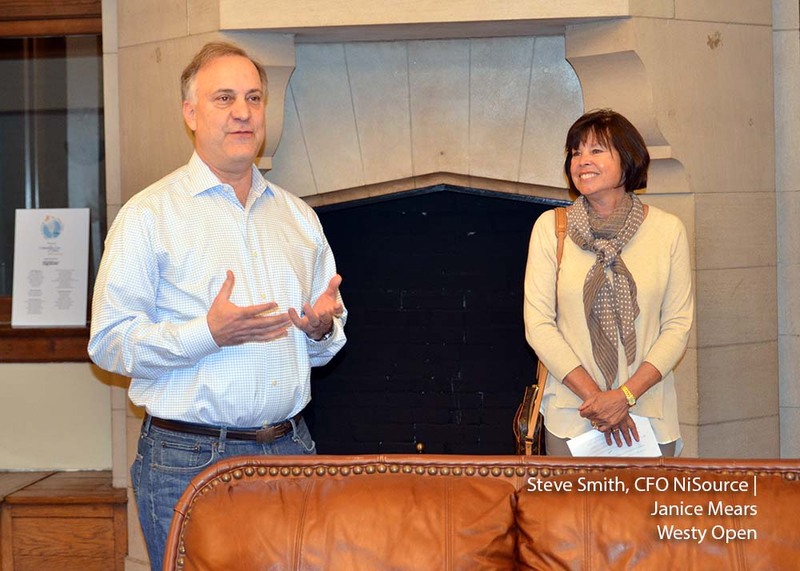 It was a great event, highlighted by a great party hosted by Daniel and Lisa Kennedy in their Atlanta home. 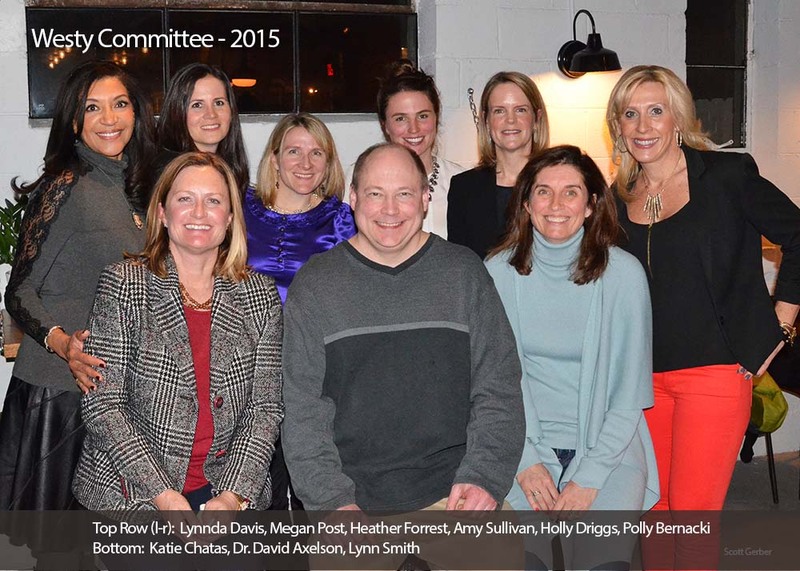 Columbus-area participants included: Heather Burke and Anneliese Adkinson, Jill Gilbert and Pam Lippy, Eric Heil and Ox Smith, Scott and Kyle Gerber (now in Atlanta), Amy Heil, and Dan Morneau. Avoiding the snow apocalypse from the previous day, the weather was much better for Elysium's Columbus Men's "B" tournament. It was held on Sunday, February 22nd. 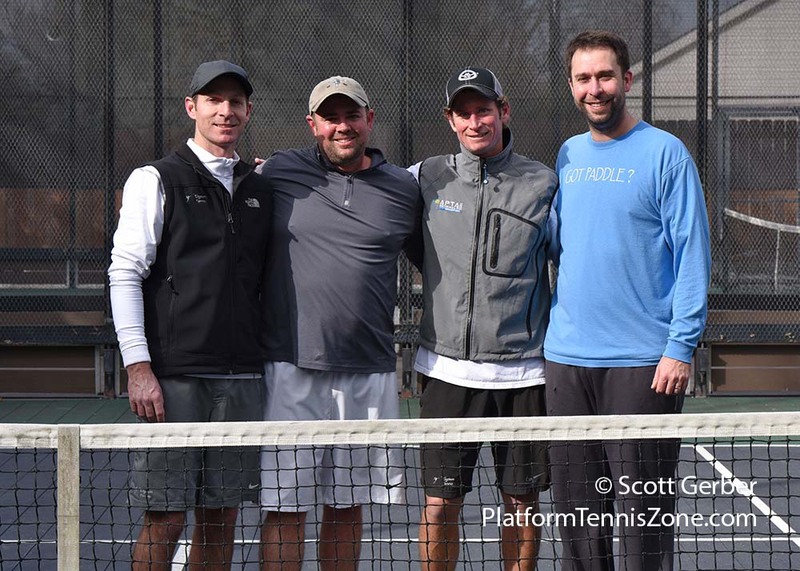 Chip Marlowe and Tim Madison were the champions, defeating Ben Lilly and David French in the finals. 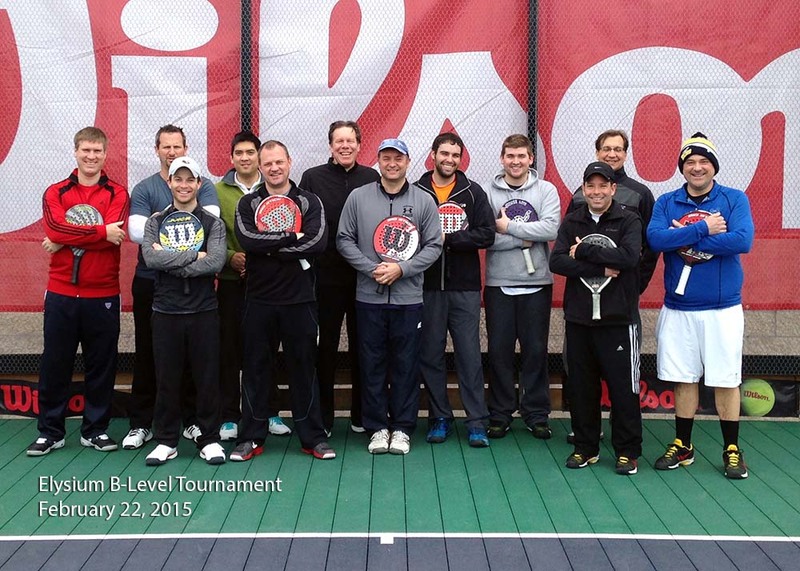 Elysium Tennis is having a B-Level tournament on Saturday, February 21 for women, and Sunday, February 22 for men. 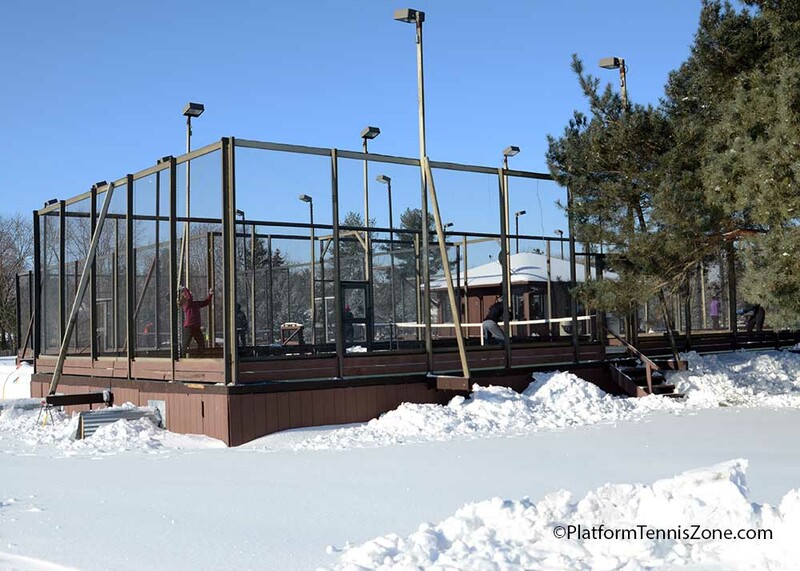 This would be an ideal tournament for the men and women who are participating in the platform tennis leagues this winter. For more information about the tournament, contact Jake Wilson. Jake's contact information is in the flyer to the right. 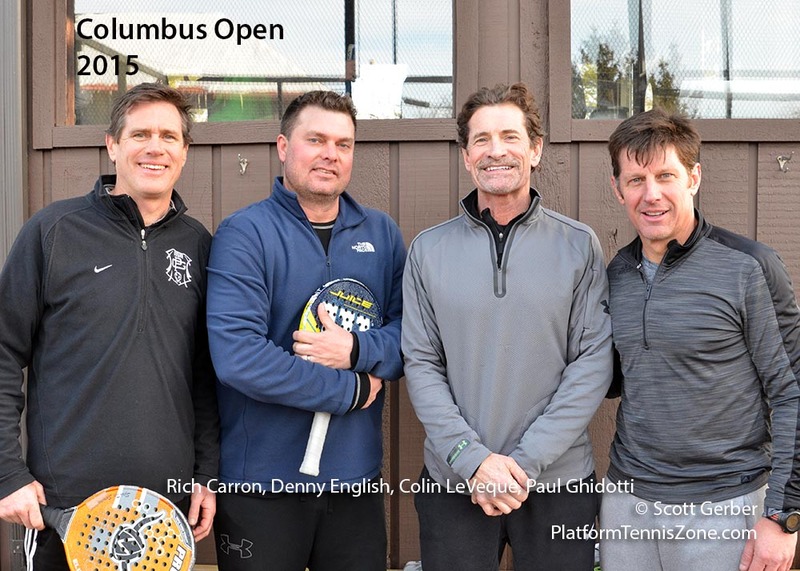 Scioto Country Club and Elysium Tennis hosted another great Columbus Open. The weather was ideal for viewers, but a bit sunny for participants. 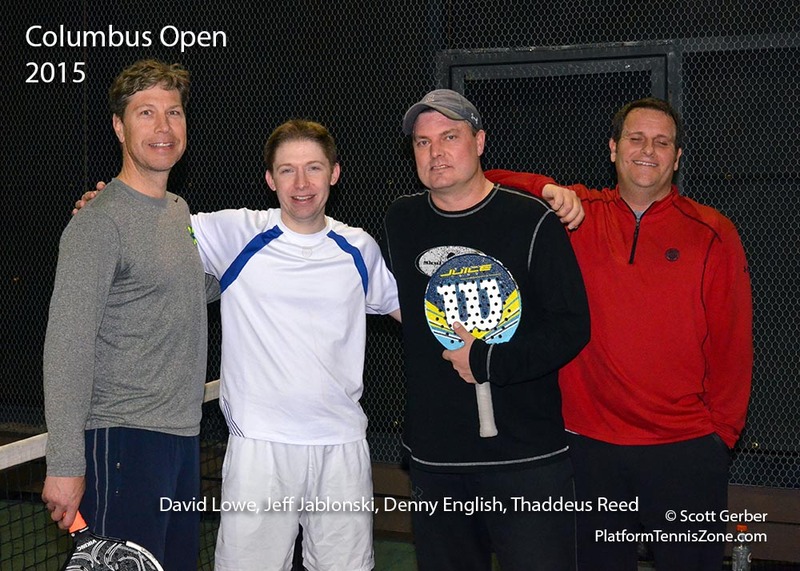 Denny English and Thaddeus Reed won Saturday's Open tournament in a close, three-setter against Jeff Jablonski and David Lowe. 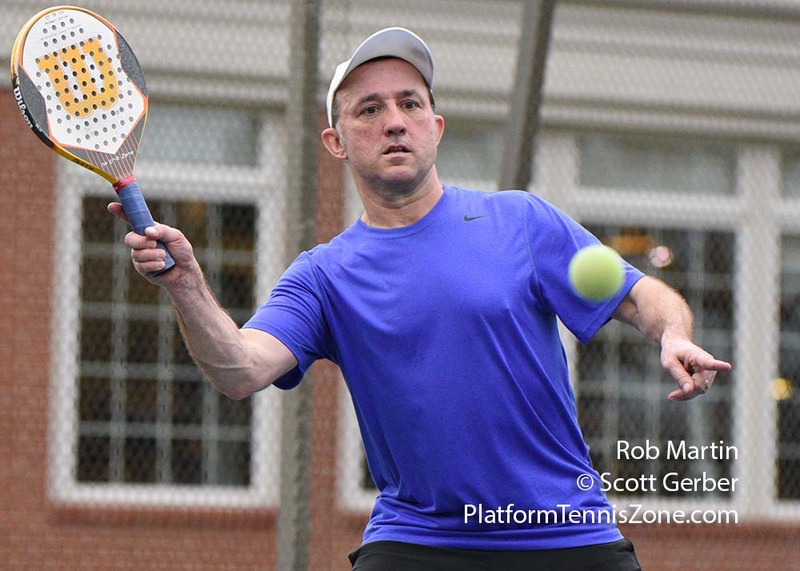 In Friday's 90's tournament, Paul Ghidotti and Colin LeVeque beat Denny English and Rich Carron, 6-2, 6-1, in the finals. 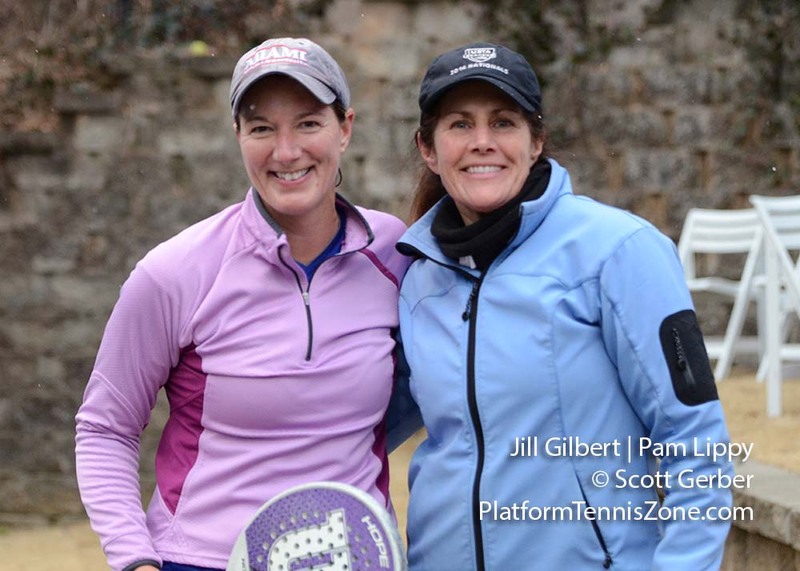 Jill Gilbert and Pam Lippy won the Women's tournament held on January 31st. 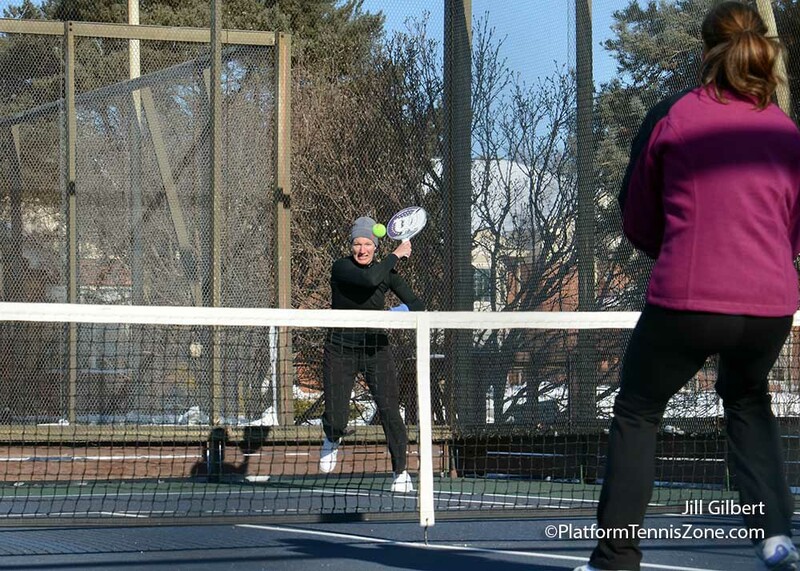 The weather has cooperated so far this season for the platform tennis leagues. Elysium leads the Men's A Flight, while Worthington Hills Country Club is in front in Flight B. There is a new women's league this year. Elysium, Worthington Hills, and Rocky Fork are a few of the clubs that are participating. Photos to the right include participants in both leagues. 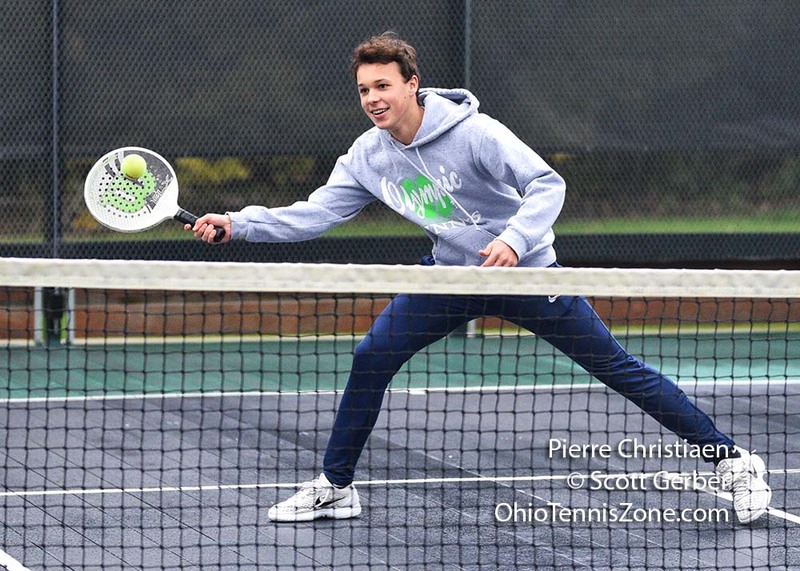 Click to view all of the action photos for several players on Scioto's Men B1 team. It was a bit of a slow start but the season is now rolling. The first team featured is the New Albany Men B team captained by David Walters. This photo was taken as New Albany Men B prepared to play Worthington Hills. Worthington Hills Men B won the match, 2-1. 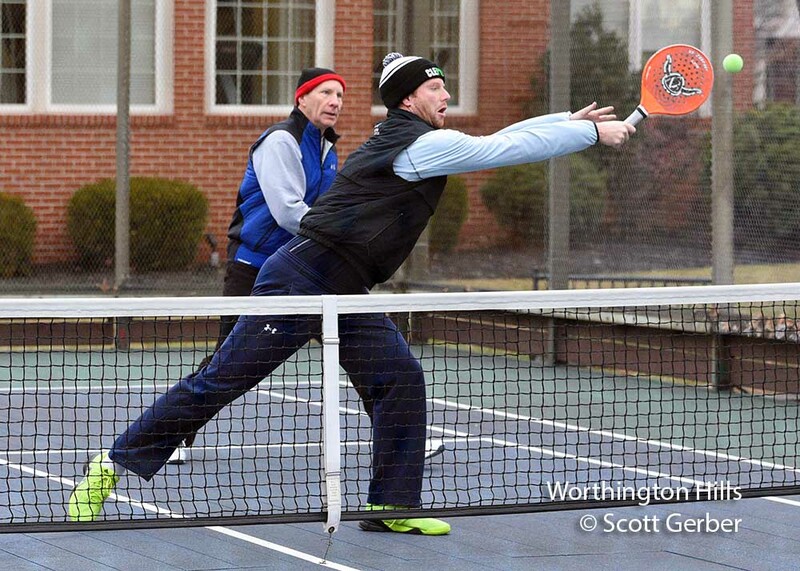 In the only other score reported, Worthington Hills Men A defeated Rocky Fork Men A, 3-0. To view the league results, click on League in the upper navigation bar and then select League Information, or click here. 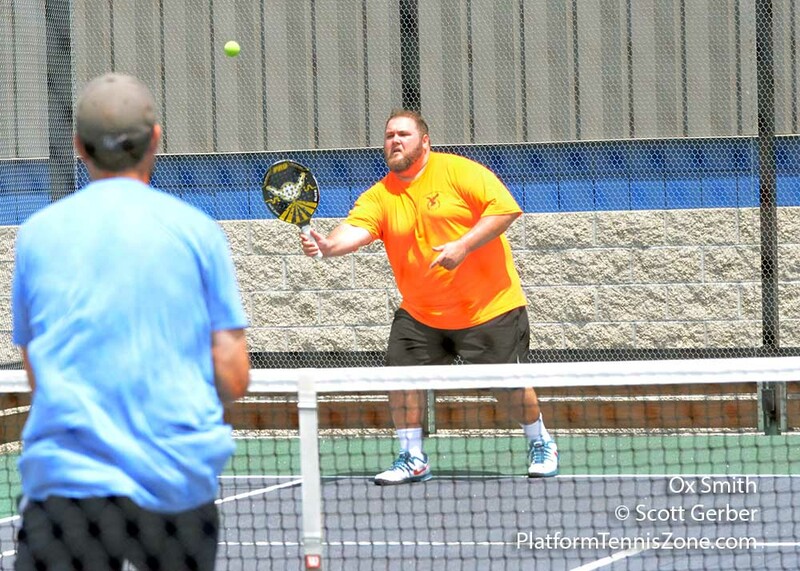 The first annual Battle at the Mudhole summer platform tennis tournament was held on Sunday, June 29. Even though it was sunny and the temperatures were above 30 degrees, it was a great success. 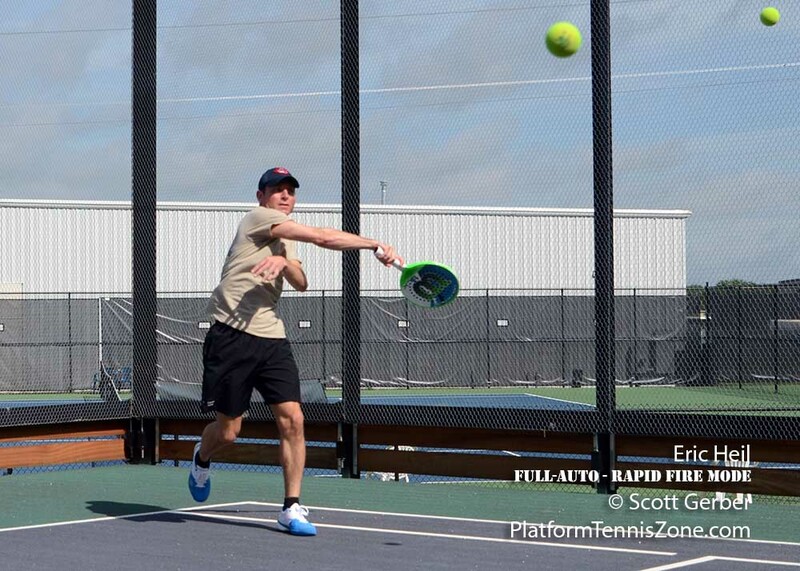 The event was held at Elysium Tennis, and 14 teams competed in temperatures that reached 91 degrees. The teams included players from Atlanta, Charlotte, Cincinnati, Cleveland, Columbus, and Dayton. 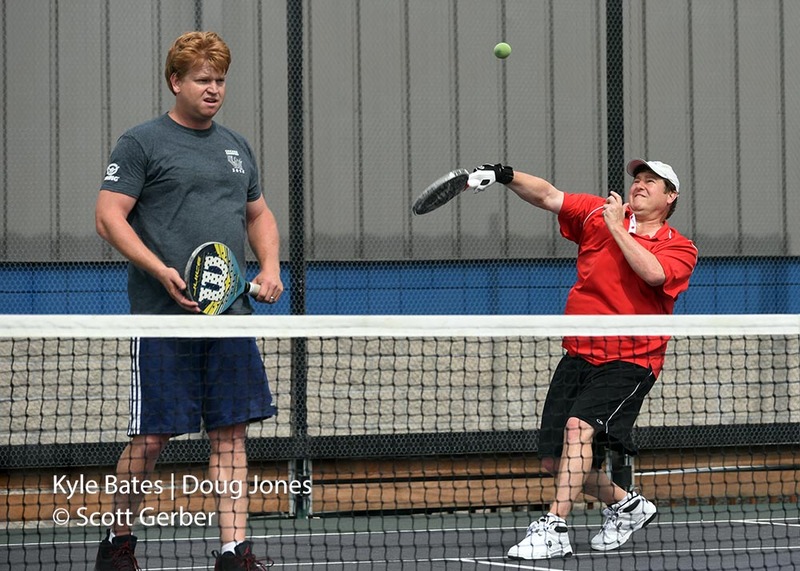 In the championship match, Denny English and Bryan Koniecko defeated Thaddeus Reed and Casey Watt, 6-1, 7-5. 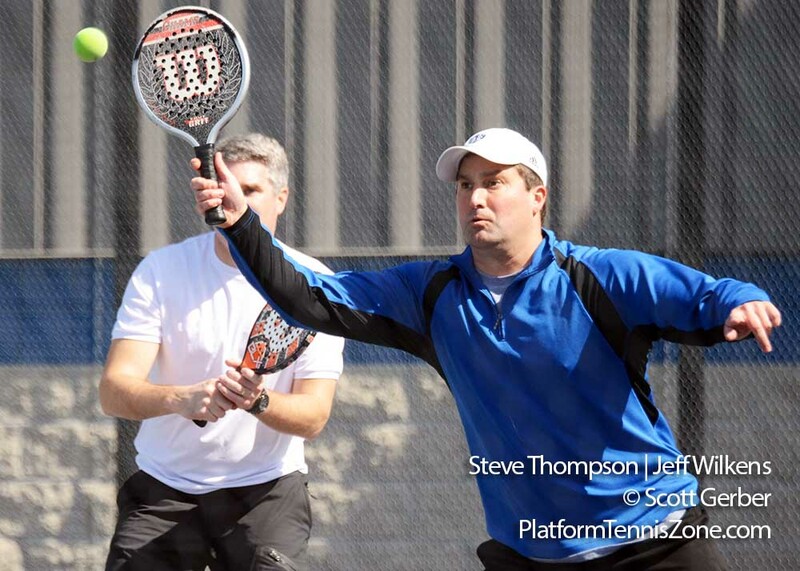 The sponsors were Mark Kebe's Total Platform Tennis and Colin LeVeque's ShadeTree Canopies. There were a wide range of skill levels, and the Viking Low-Bounce ball was used for the event. 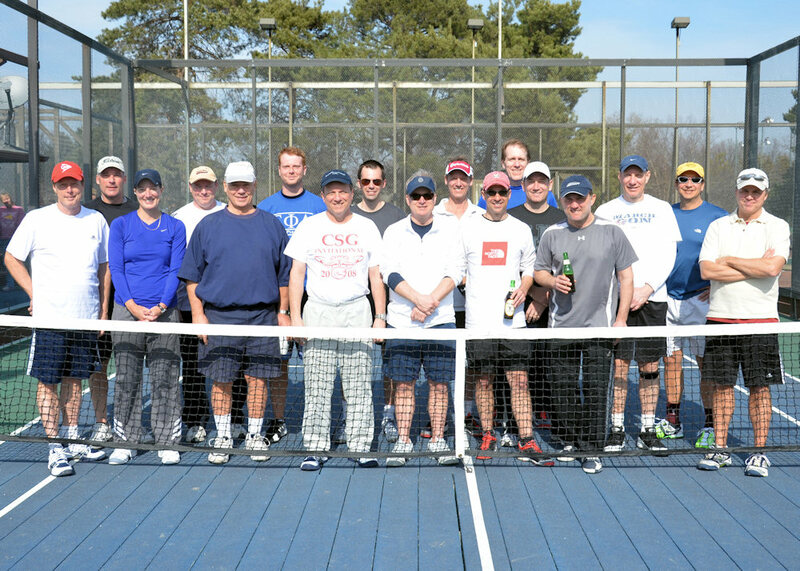 On Saturday, March 8th, 96 local players competed for a great cause on a great weather day to benefit Nationwide Children's Hospital. This annual event is conducted by TWIG 3. Proceeds are expected to equal almost $40,000. Last year, $36,000 was raised. Following the competition, a Post Party was held at the Jeffrey Mansion in Bexley. 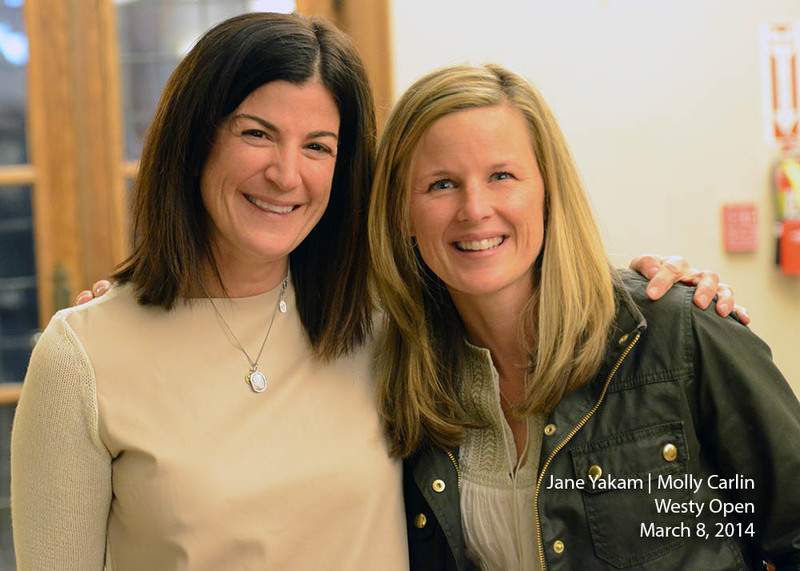 The event was chaired by Jane Yakum and Molly Carlin. Melissa Lacroix handled the player / court logistics. 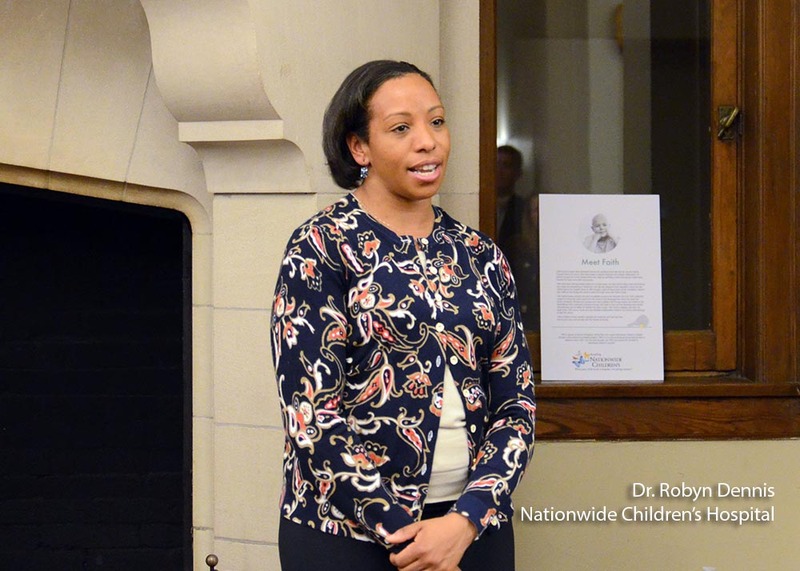 Dr. Robyn Dennis of Nationwide Children's Hospital shared how the funds would be put to good use. 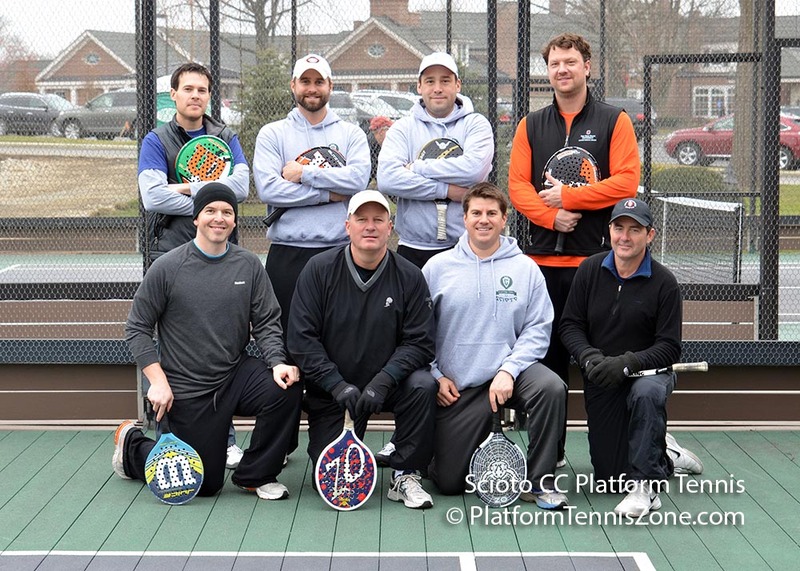 On a rare, nice winter day, players and onlookers equally enjoyed the weather for the Columbus Inter-Club Platform League championship. Scioto Country Club beat Rocky Fork and New Albany to win the Flight A league. Worthington Hills won the Flight B Championship after beating Scioto B2 in the semi's and Scioto B1 in the finals. Worthington Hills' Flight B team lost a few sets along the way but did not lose an individual match all season. Elysium also received the "Would Have Won Flight A" award. 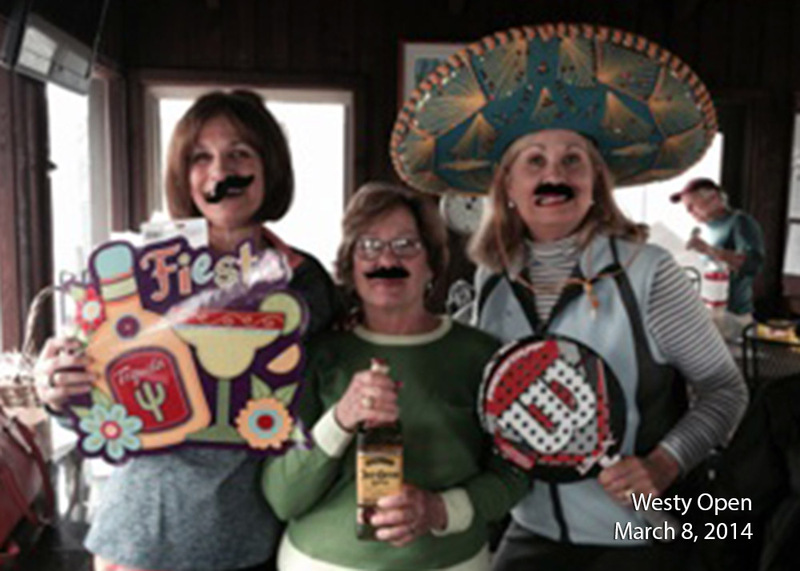 Everyone enjoyed the great food, beverages, and paddle play.. 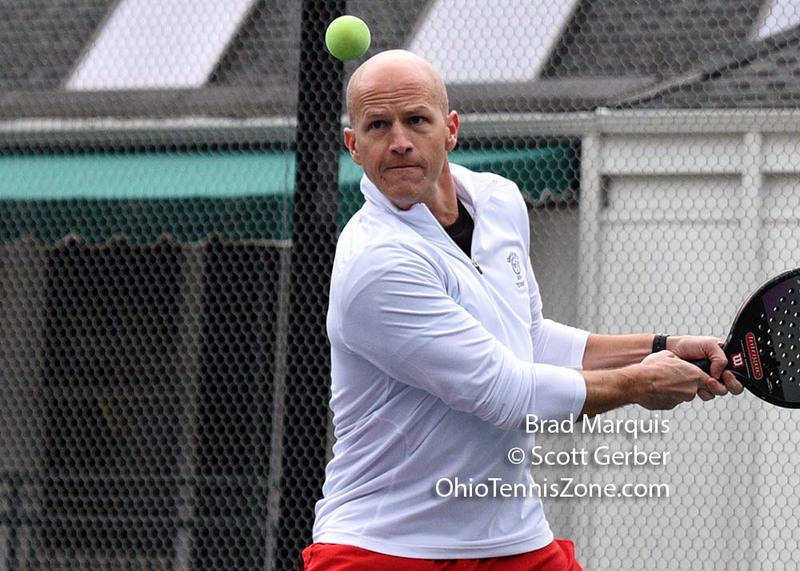 The CIPA end-of-season tournament and party will take place this weekend at Scioto Country Club and Elysium Tennis. 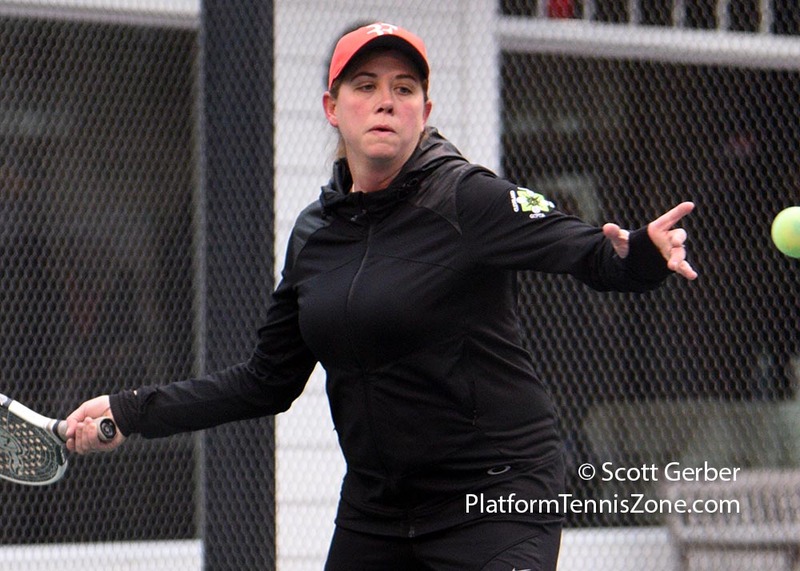 The #1 seeds are Elysium Tennis in Flight A and Worthington Hills Country Club in Flight B. The finals and party will take place at Scioto Country Club. Click to view the draws. 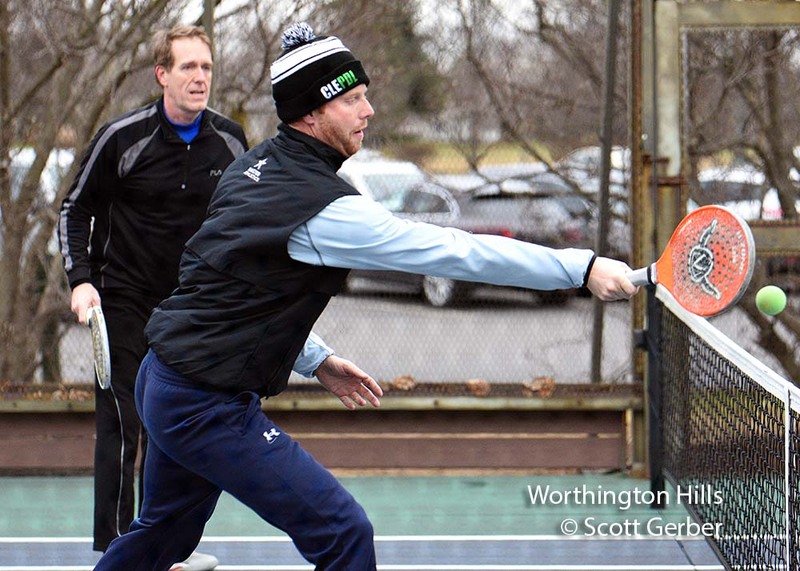 It was another cold day in central Ohio with temperatures registering 10 degrees at Worthington Hills for the start of the Columbus Open Platform Tennis Tournament on Friday. The Men's Open champions were Ryan Baxter and Ricky Heath. 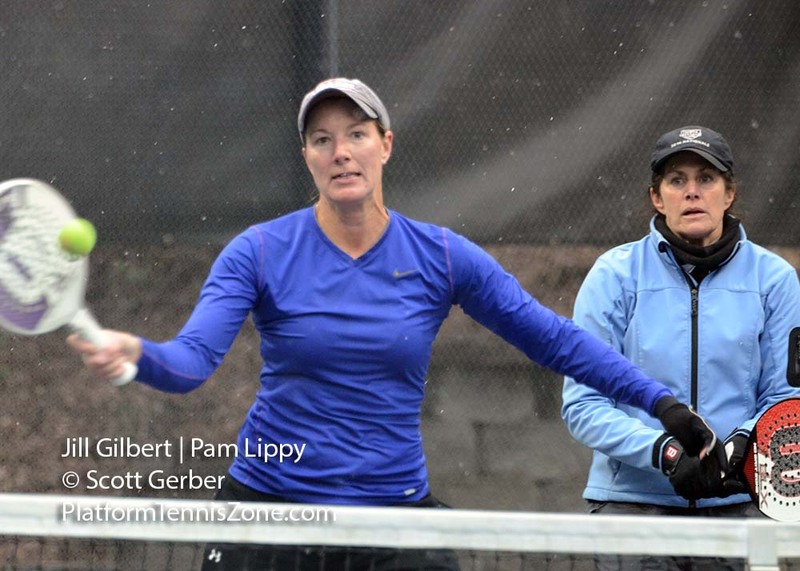 Nancy Budde and Tracy Glassmeyer won the Women's Open, and Denny English and Mark Kebe won the Men's 90s. The number of players competing was up this year. There were 24 players in the Men's 90's, 56 players in the Men's Open, and 48 women in the Women's Open. 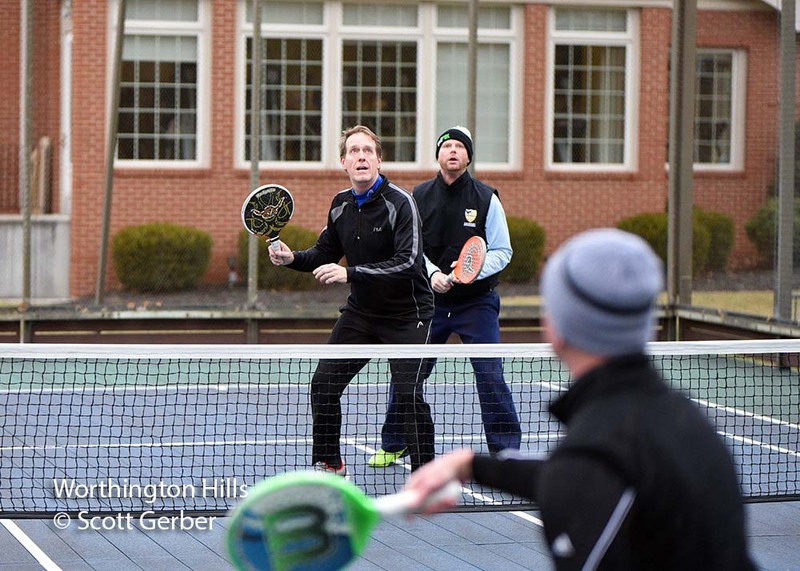 The matches were played at Elysium Tennis, Scioto Country Club, and Worthington Hills Country Club. 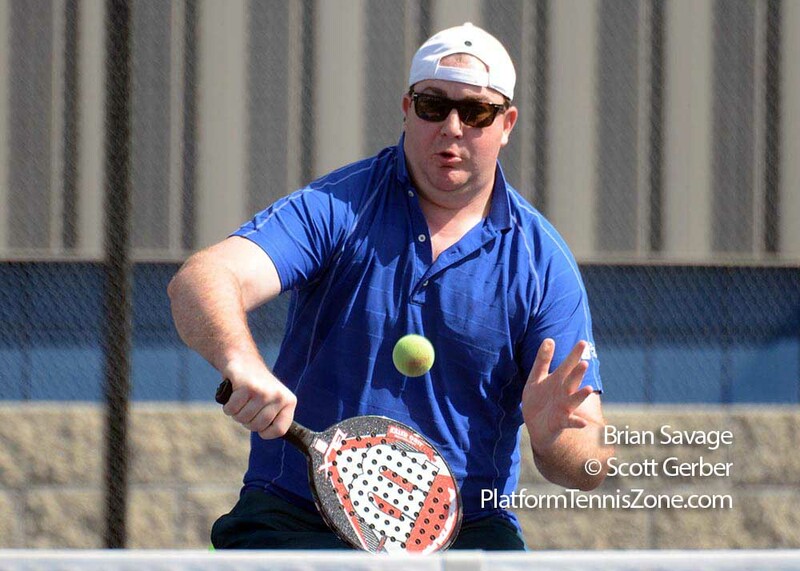 A number of central Ohio platform tennis players migrated south last weekend to participate in the 9th annual Peachtree Invitational. And in the "timing is everything" category... based on today's Columbus Dispatch front page photo of Atlanta's snarled winter traffic, thankfully the players returned to Columbus. 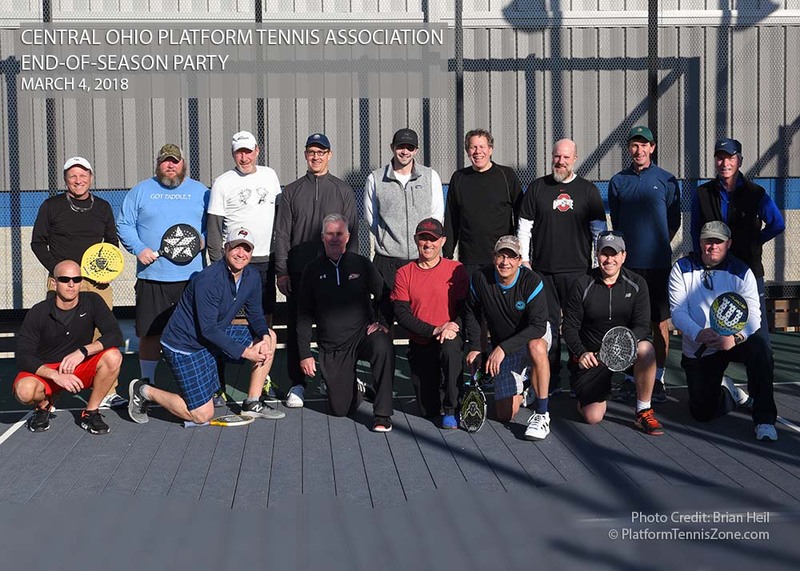 Central Ohio players participating in the tournament included: Amy Heil (Elysium)-Heather Burke (Elysium), Scott Gerber (WHCC)-Kyle Gerber (Atlanta), Eric Heil (Elysium)-Dan Mott (Cincinnati), and Dan Morneau (Elysium)-Mark Morneau (Atlanta). 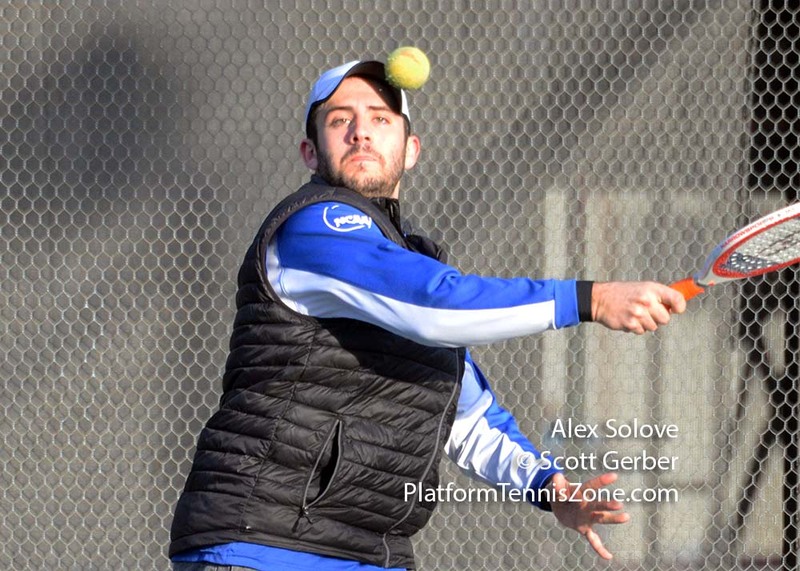 Peter Lauer and Freddy Goldenberg were the tournament chairs and it was an extremely well-done tournament despite having only nine courts available to them. The Saturday night party was exceptional and it was held at the private residence of Dan and Lisa Kennedy. Approximately 100 paddle people attended. Make sure that you sign up for the Columbus Open. It will be held February 7-8. Click to sign-up. 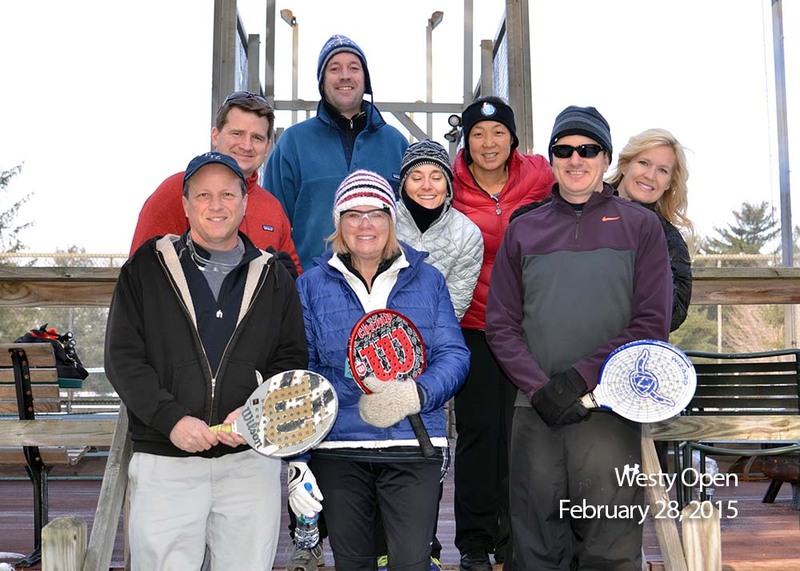 Mark your calendars to participate in the 13th annual Westy Open Paddle Tennis Tournament and Post Party on Saturday, March 8. It is for a great cause and it benefits the Pediatric Cancer Program at Nationwide Children's Hospital. 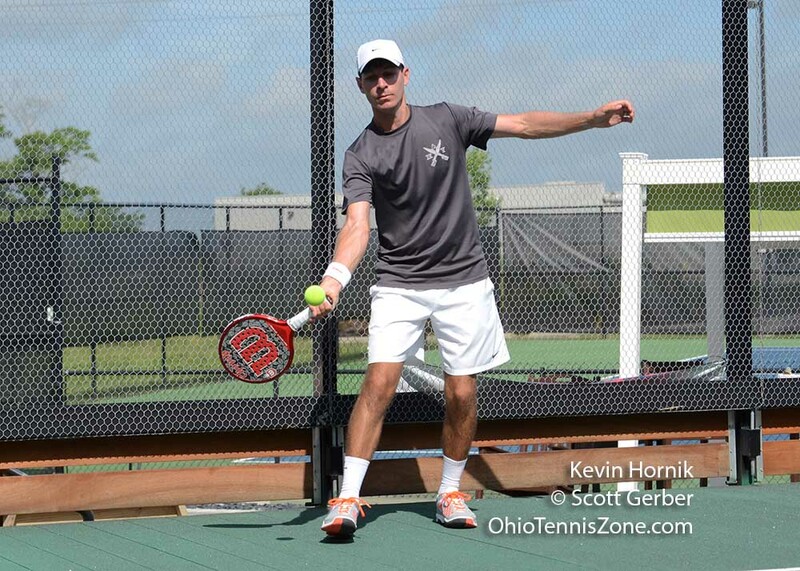 This co-ed tournament places players in their appropriate skill groups and the matches are played at the Columbus Country Club, Elysium Tennis, New Albany Country Club, Rocky Fork Hunt Club, Scioto Country Club, and Worthington Hills Country Club. New for this year are two beginner's clinics to be held at Elysium. The Post Party at The Jeffrey Mansion in Bexley follows the event. To play, contact Melissa Lacroix at 614-253-8462. For sponsorship or Post-Party information, please contact Molly Carlin at (614) 506-6642 or Jane Yakam at (614) 783-4980. 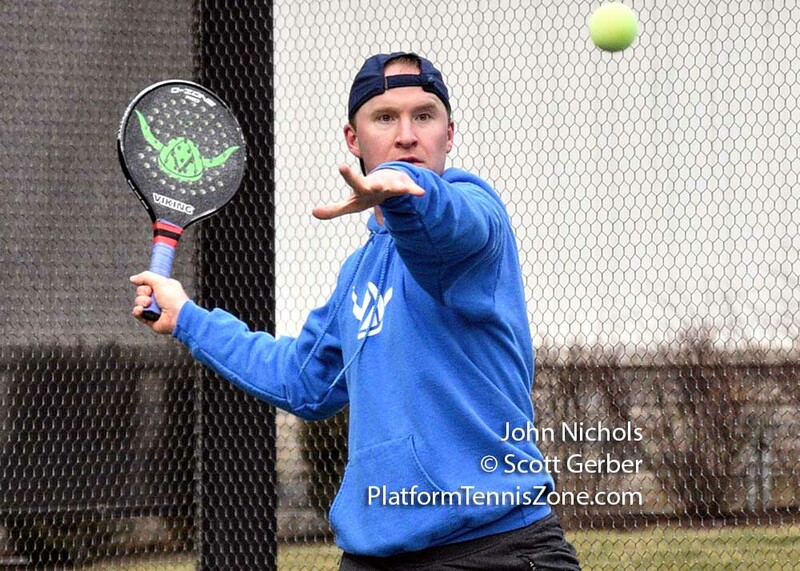 The goals of this web site are to keep everyone informed about platform tennis in Columbus, Ohio and to help everyone get to know each other for social and business purposes. A new feature is now available to assist with the "getting to know you" goal. 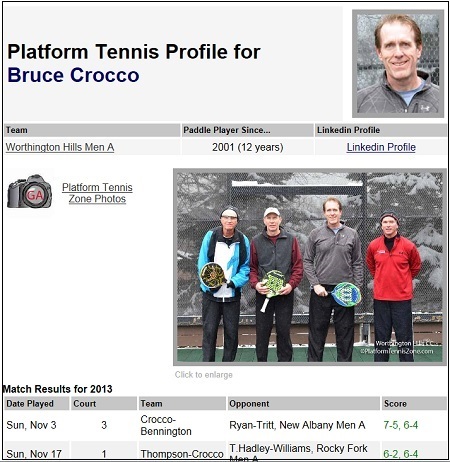 For those playing in the Columbus Platform Tennis League, new profile pages are slowly being introduced. 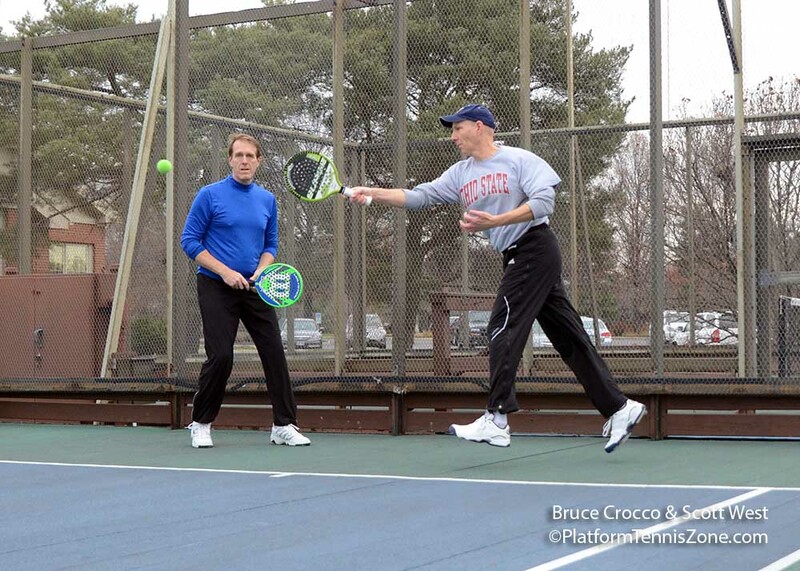 Click to view the profile for Bruce Crocco. 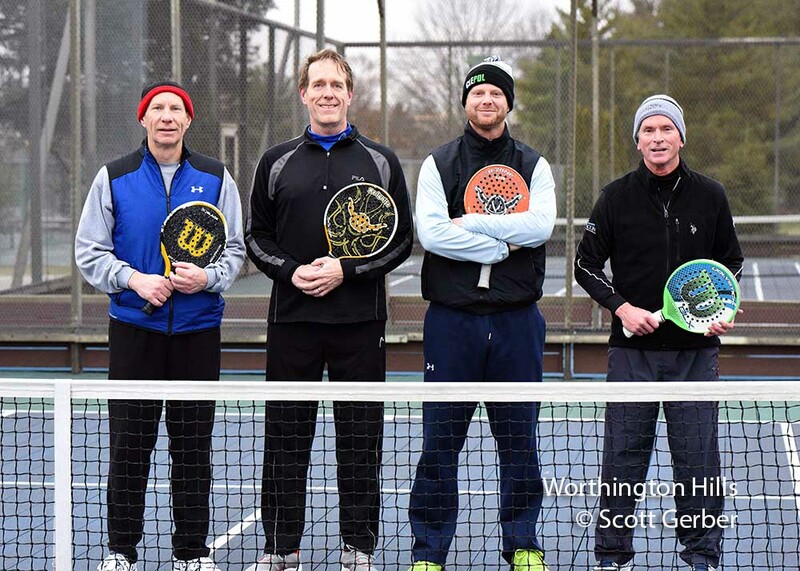 Bruce is the captain of the Worthington Hills Men A team. 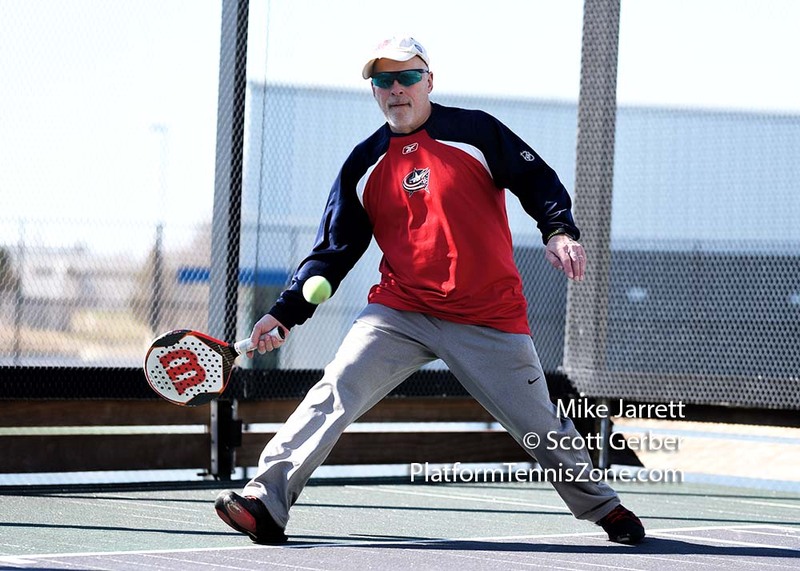 The profiles will include league results, the number of years playing platform tennis, a Linkedin profile, and action photos (when available). Currently, there are only a handful of profiles setup. To view others, click on the team names (i.e. Elysium Men B, WHCC A, WHCC B) and then click on the names in the roster which include hyperlinks. After you have paid Denny for the league fees, please send me an email or Feedback to get your own Player Profile setup. Please note that all group and action photos may be enlarged by clicking on them. Snow during this time of the year normally does not thwart play, but that was not the case on Tuesday night. The image of the net at the top of the page was taken at Worthington Hills. League play is at the halfway point of the season. In Flight A, Elysium is first, followed by Worthington Hills and New Albany, respectively. WHCC and New Albany both have 2-1 records. Worthington Hills is first in Flight B. Scioto Men B1 and New Albany are second and third, respectively. 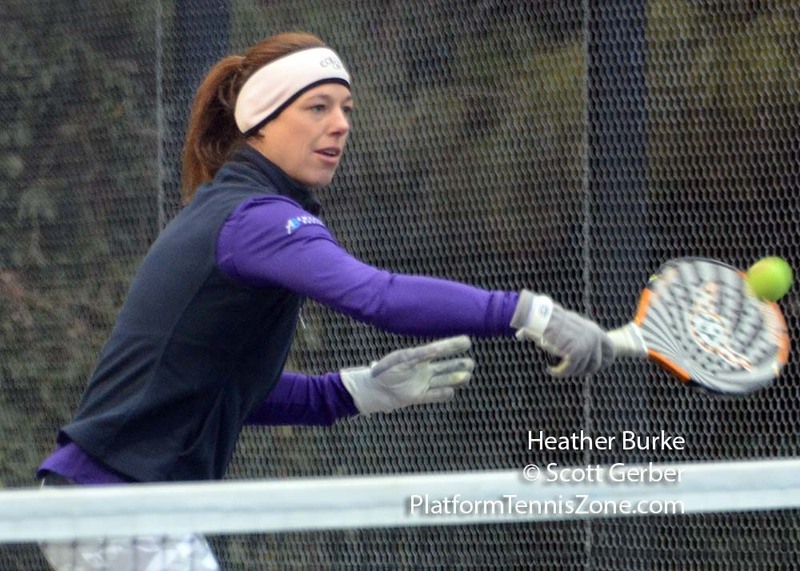 There are simply not enough action photos of platform tennis players. One reason is that it is unsafe to get inside the cage with these athletic beasts, and the other is that camera gear has to be specialized to take low-light photos. To resolve the low-light problem, I rented a high-end lens for the weekend to permit me to take photos on a cloudy day at Worthington Hills and at night at Elysium. I took over 300 photos on Saturday, and the four photos to the right were a few of my favorites. More photos will be displayed throughout the season. Just click on the image to enlarge it. 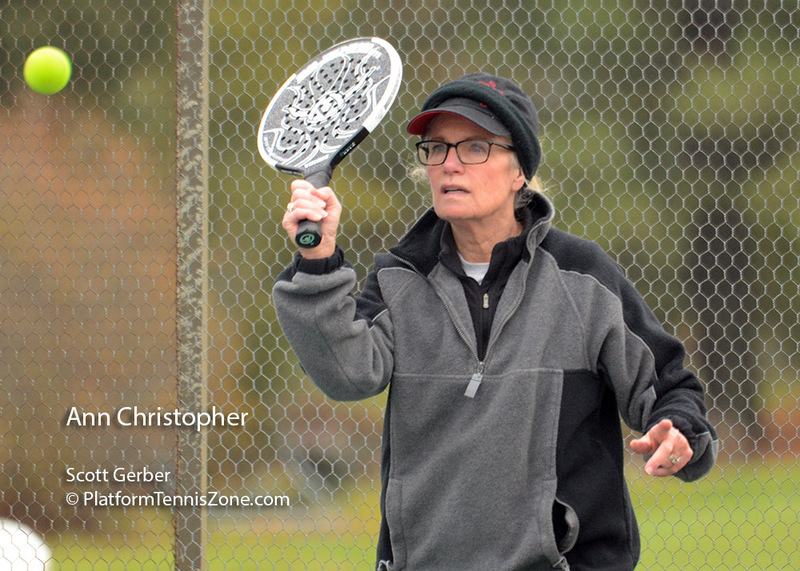 Contact me if you would like photos taken at your club. I'm sure we can work out an arrangement. Only two match results have been submitted from this weekend. Captains, please get your results into me soon. 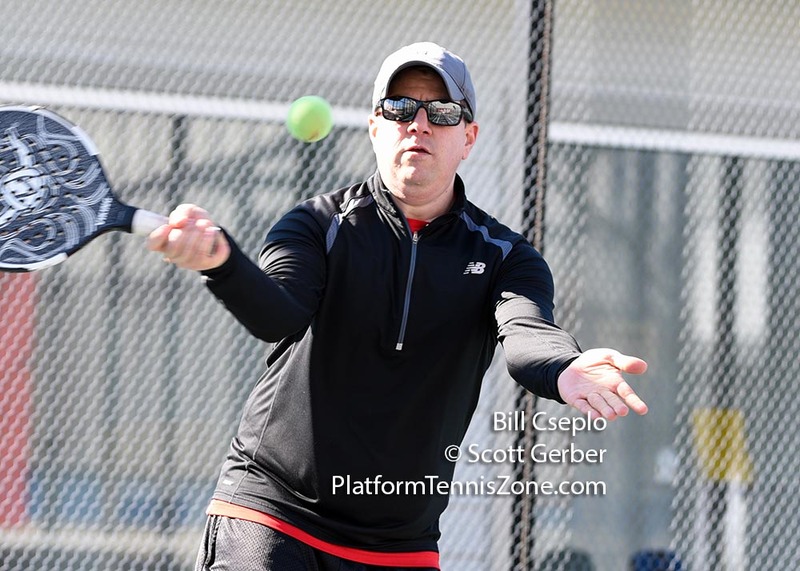 For those of you who enjoy tennis photos, my tennis web site includes photos for many Columbus, Cincinnati, and Cleveland high school players. It was the second week of league play. The scores will be accumulated and provided online tomorrow. The camera was not quite setup correctly so Scioto's team picture is fuzzier than it should be. Next time, I'll remember to switch the settings after switching camera lenses. 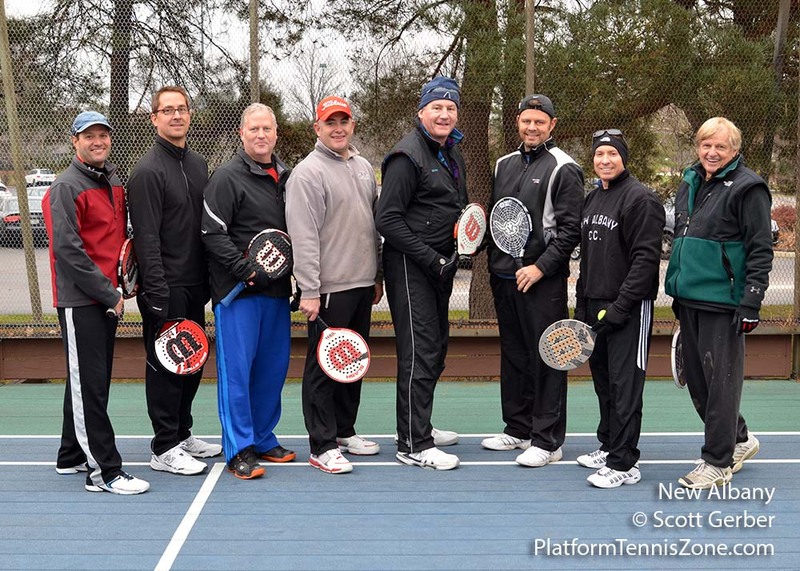 Platform Tennis is a social sport and this web site will reflect this. Pictures will be plentiful to help players match names with faces. For those playing in the league, click on the links to see what has been done for the Elysium Men B, Worthington Hills Men A, and Worthington Hills Men B teams. This will be done for all teams that provide pictures. 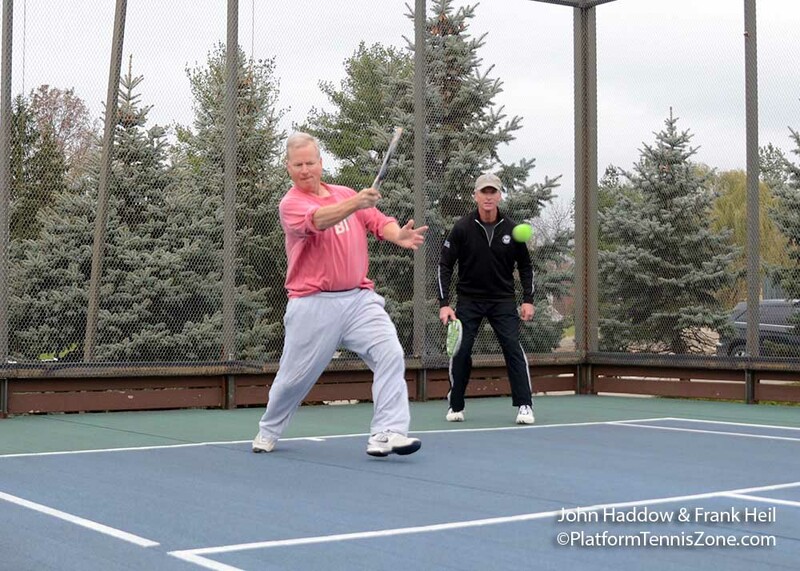 Hopefully, the players you meet during platform tennis matches can be leveraged in other beneficial ways. Teams will field three doubles teams (rather than four as we had last year). Each team will likely include 8-10 players. "Flight B" players may play "up" on "Flight A" teams but "A" players may not "play down". Flight B players may only play on their designated team. Everyone will pay $40 (with $10 of this going toward this web site). 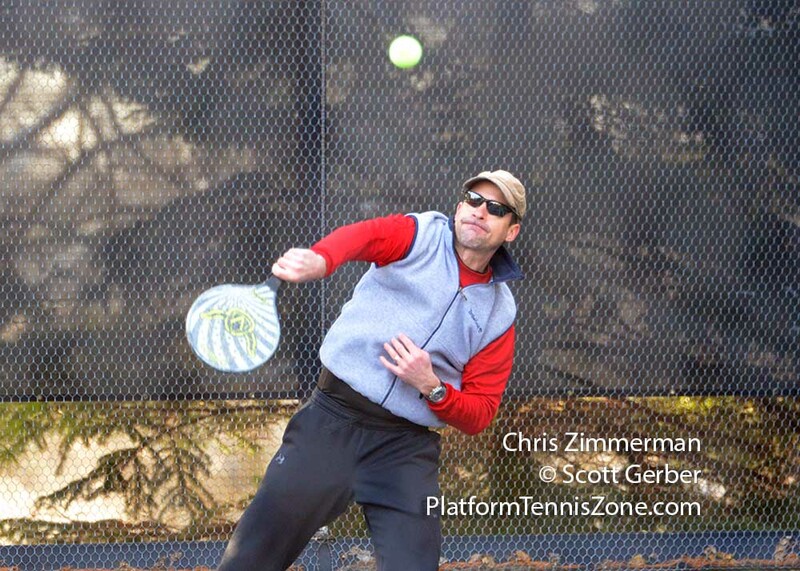 Note: Since Worthington Hills uses PlatformTennisZone.com for its reservation system, their members will not incur the website fee. Each team will play their opponents twice. League play will take place on Sunday's. The all-day, end-of-year tournament and party will be held on a Saturday at the end of the season. The schedule for the league is here. If you do not wish to have your photo included online, just let me know. Here are a few photos from the season. 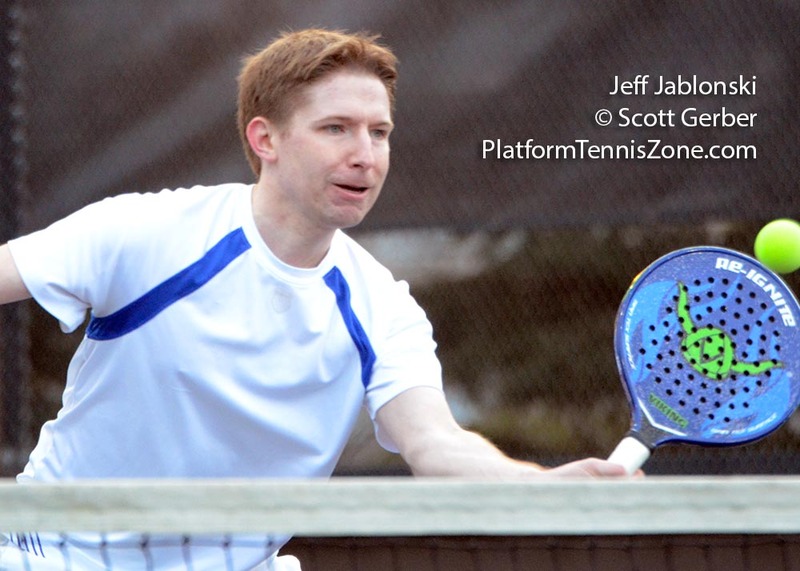 They include photos from the WHCC interclub tournament and the Westy Open Tournament. 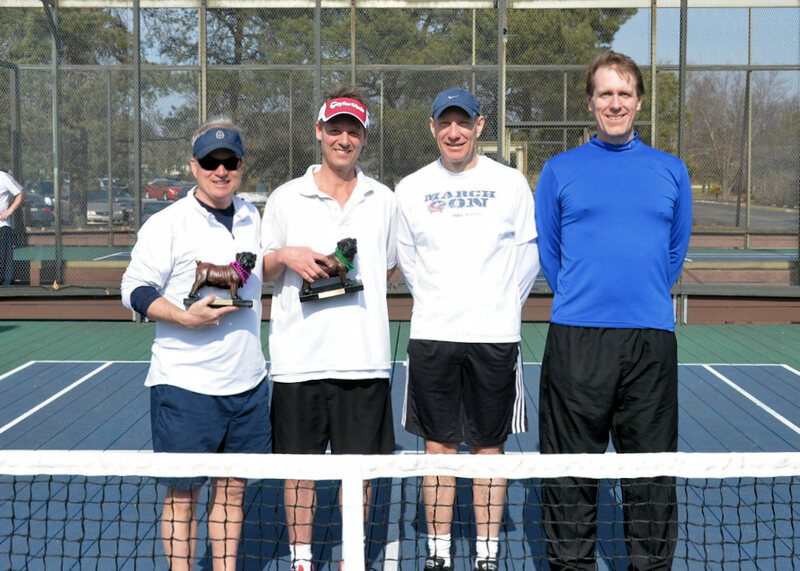 Row 1 (l-r): John Haddow and Lance Thompson won the WHCC Club Championship, and Scott West and Bruce Crocco were runner-ups. Second picture includes all of the participants for the WHCC tournament. 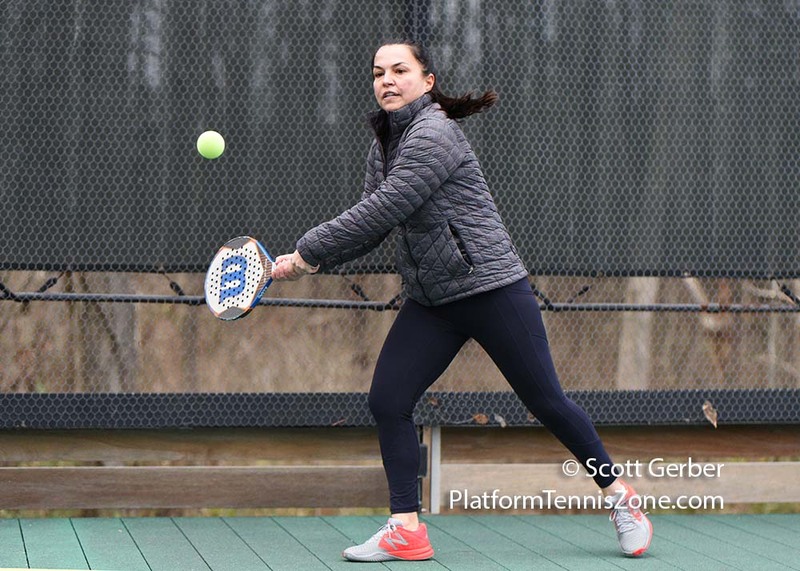 The idea behind this site is to help you get to know other platform tennis players, play more matches with players of similar ability, find a sub when you cannot play, and make your club membership even more valuable. You can even make your reservation online and quickly send email confirmations to your fellow players. Currently, the site is only available to Worthington Hills Country Club players. 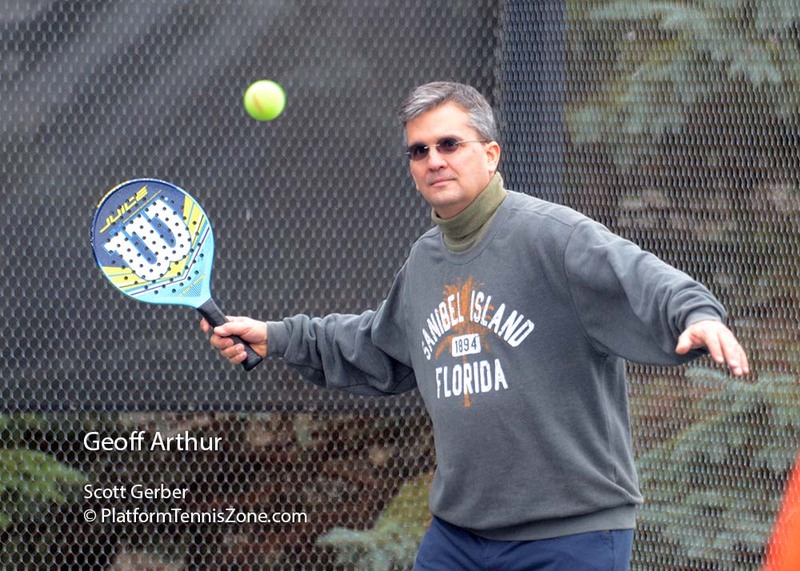 The eventual goal is to provide a connection to enable platform tennis players from all area clubs to quickly find other players who would like to play. 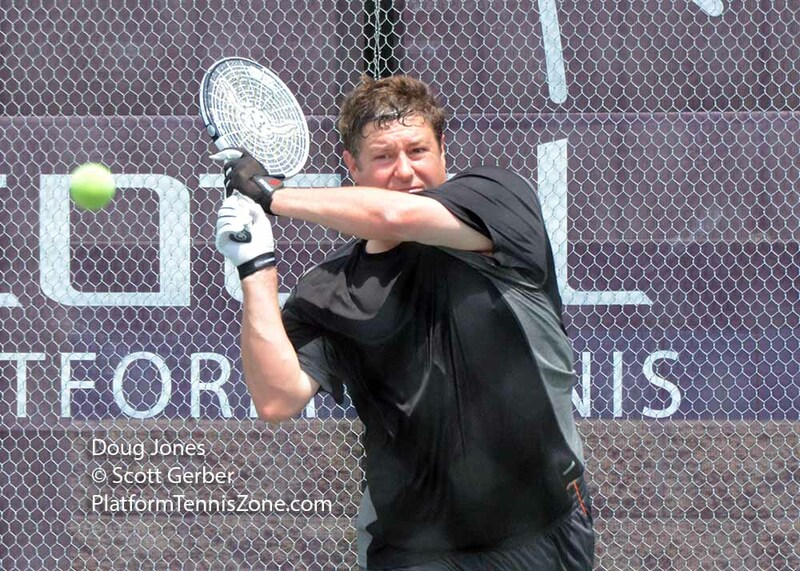 Benefits of the web site include the ability to view up-to-date, platform tennis-related contact information for other players. Avoid the email confusion and reduce the time necessary to find a substitute. You can post sub-related information to others in your group and view comments from others. Since weekends are a terrible thing to waste, you can post your weekend availability and view the plans of others. By clicking on a player's name, you can quickly obtain contact information. After you have found others to play, click on Reserve to book a reservation. All of the information is password protected and access is not permitted until your sign-up information is verified. Click on Player Sign-up to get started. Disclaimer: All opinions and commentary expressed by Gerber Analytics, LLC are solely Gerber Analytics, LLC's and they do not reflect the opinions of advertisers presented on the Gerber Analytics, LLC website. 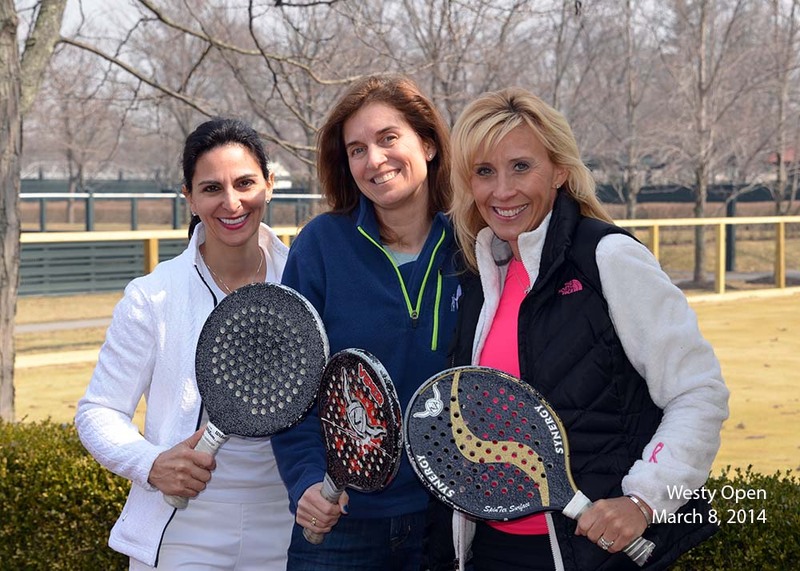 This site is not affiliated with any platform tennis clubs, including Worthington Hills Country Club. Please submit a Feedback message if you have any questions or comments. Privacy-Related Information: Google and Amazon ads are included on this site. They use "cookies" to identify your browser for use in serving ads and tracking your activity. For more information, please visit their respective sites. Please refer to your browser's help files if you wish to alter your privacy settings.